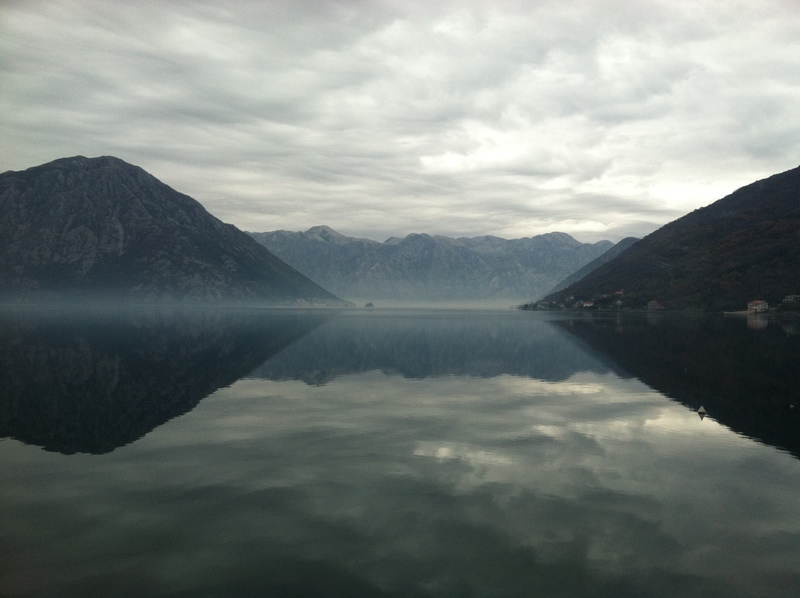 As many of you may know, I was originally planning on spending the holidays with my friend traveling from Slovenia down through the Balkans, but last minute our plans fell through. At first I was pretty disappointed, but sometimes you just have to go with the flow and let things work out the way they are supposed to. Luckily, another one of my friends Makena told me about an awesome trip that we could take together through an Albanian tour company. 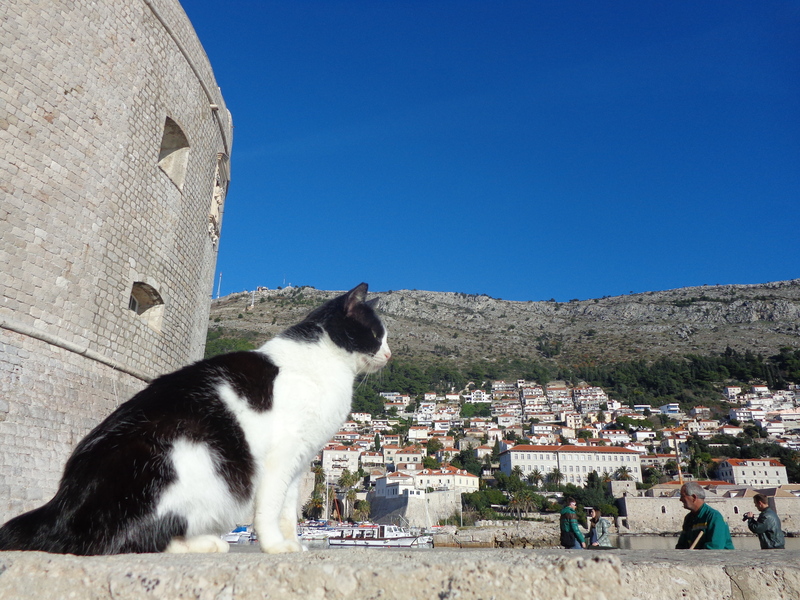 It was a three day guided tour bus trip through Montengro up to Dubrovnik, Croatia. For only 89 euros (about $110) I couldn’t resist! 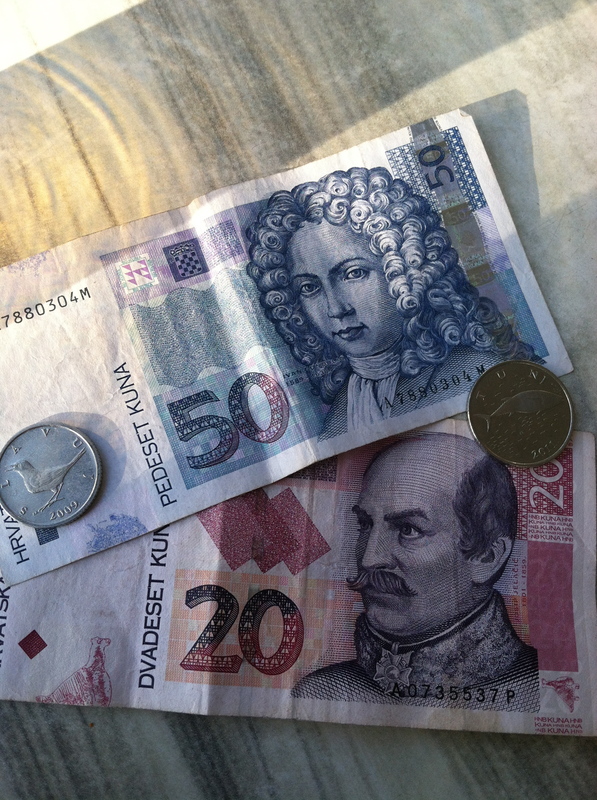 The trip included transportation, hotel, breakfast, and dinner – a great deal! 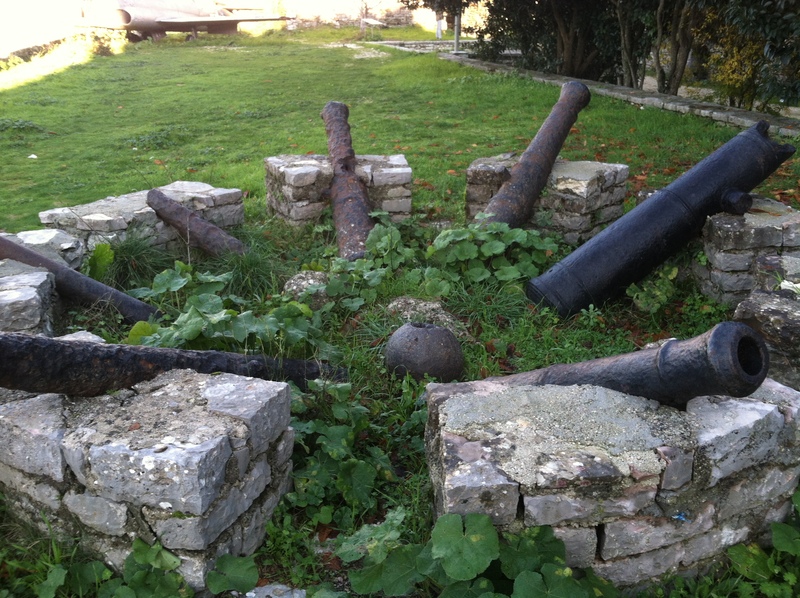 We traveled my bus the morning of the 23rd and made a stop in Budva, Montengro. 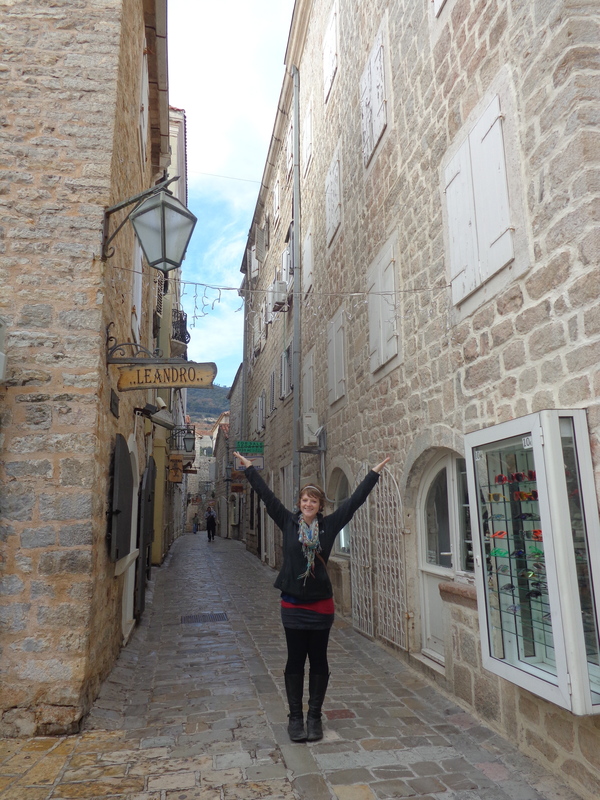 In Budva, Makena and I explored the narrow walkways of old town. We checked out the yachts and ate some expensive burek (even outside of Albania we can’t seem to get away from this delicious baked spinach pie). 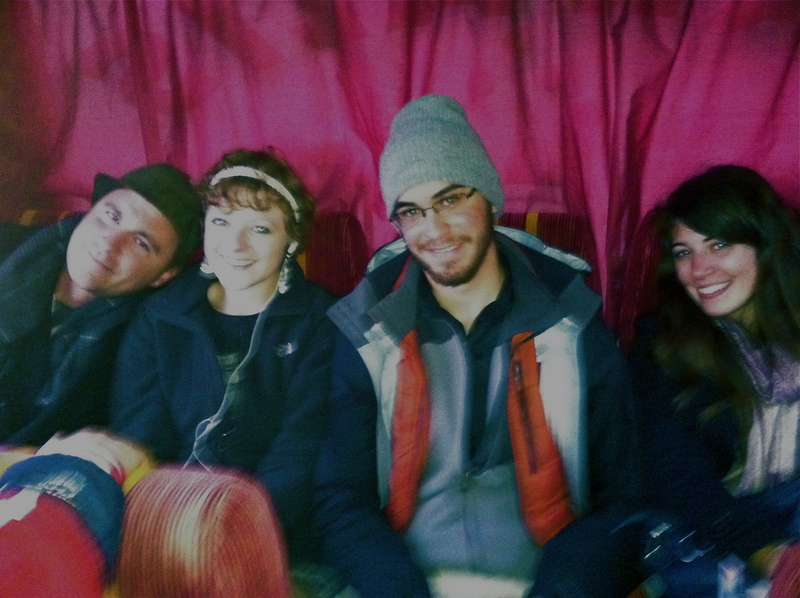 We also met some of the other Albanians on our tour bus and ended up hitting it off with a family that lives in Tirana. They were really nice and offered for us to come visit them in Tirana whenever we want – gotta love Albanian hospitability. 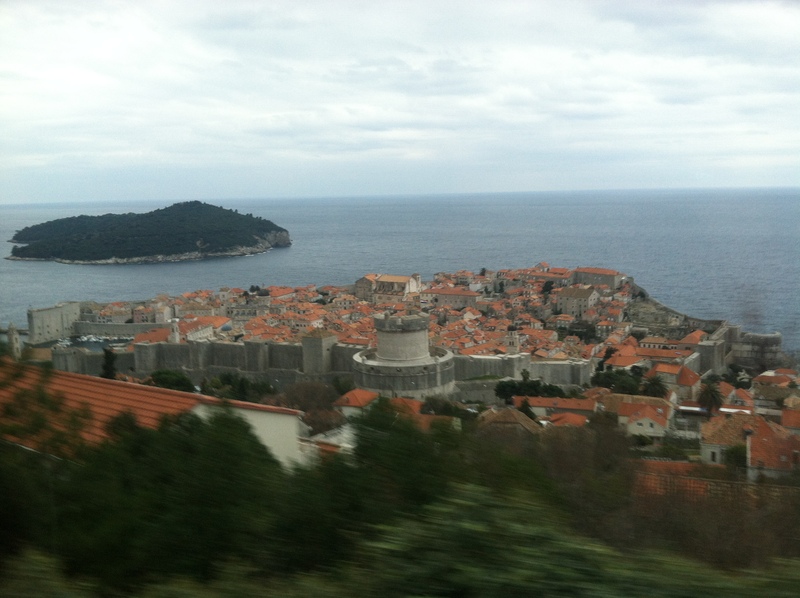 After Budva we continued up the coastal highway making our way to Dubrovnik. We took a ferry across the bay, which was a fun experience. We arrived at our hotel a little bit after sunset and got settled in before making our way out to the town for a couple of drinks. 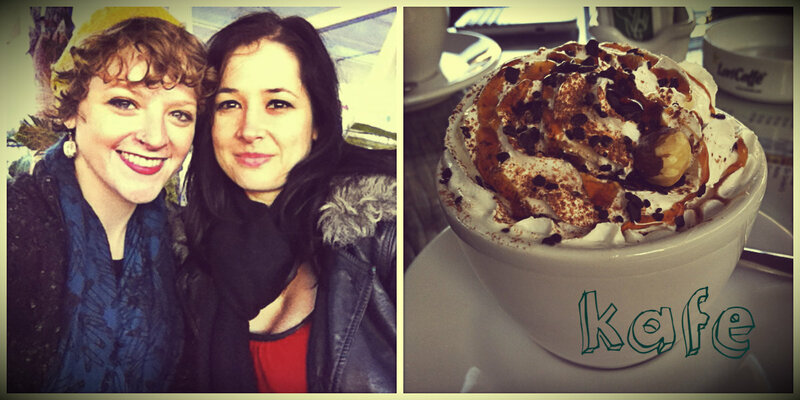 Makena and I found a nice local café that was full of women! Every coffee shop that I have been in Albania (for the most part) has been FULL of men with maybe a couple women dispersed here and there. This is especially true for my city – I am often the only female in a bar full of men. So you can imagine being in a bar that was all women felt really good. Then we ended the night with the all you can eat buffet at the hotel. 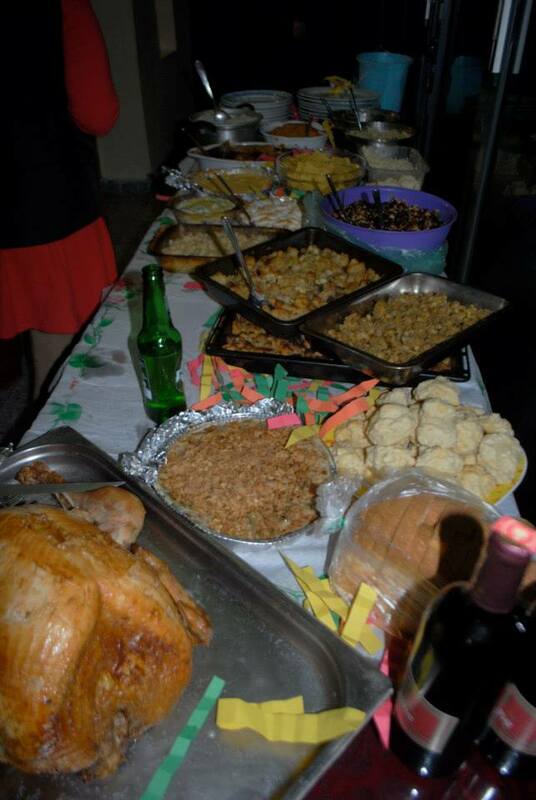 Imagine a bunch of hungry Peace Corps volunteers at an all you can eat buffet…. It was amazing. 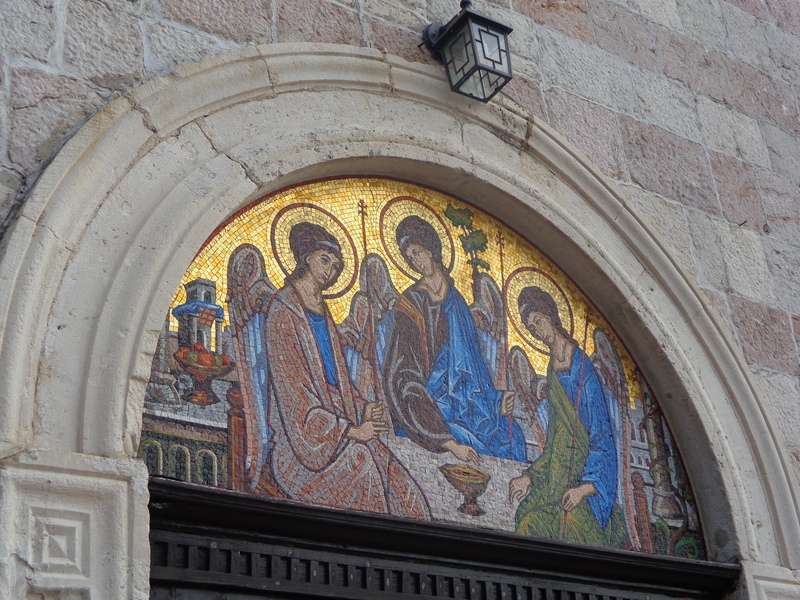 Part of a church in Budva. Hanging around with the wonderful Makena before finding some burek. 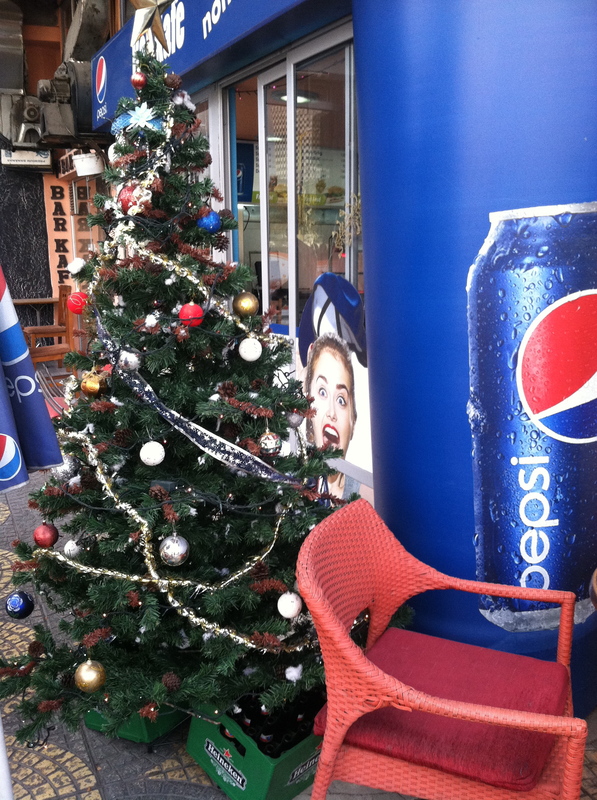 Modern Christmas spirit in Budva. 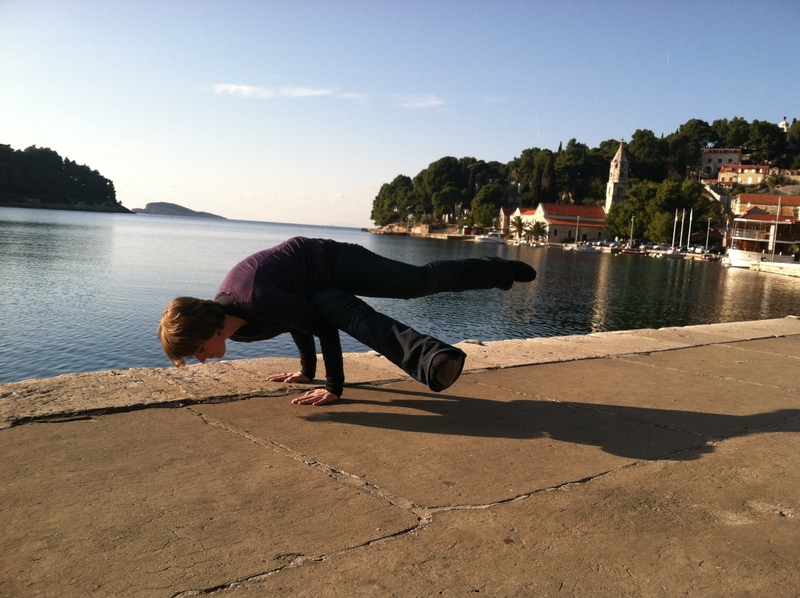 The next day was our only full day in Croatia. 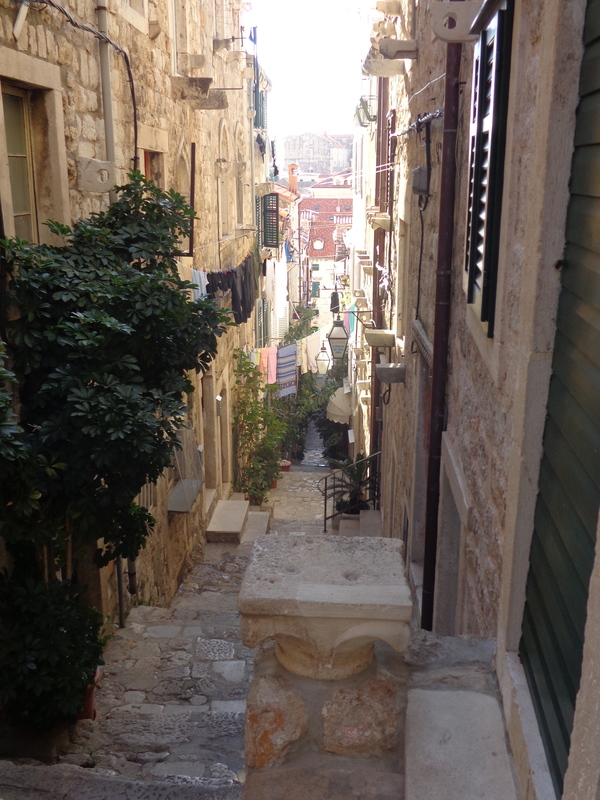 The tour was scheduled to take everyone to Old Town Dubrovnik in the morning and then a small village outside of Dubrovnik for lunch and part of the afternoon. Then the evening was free. 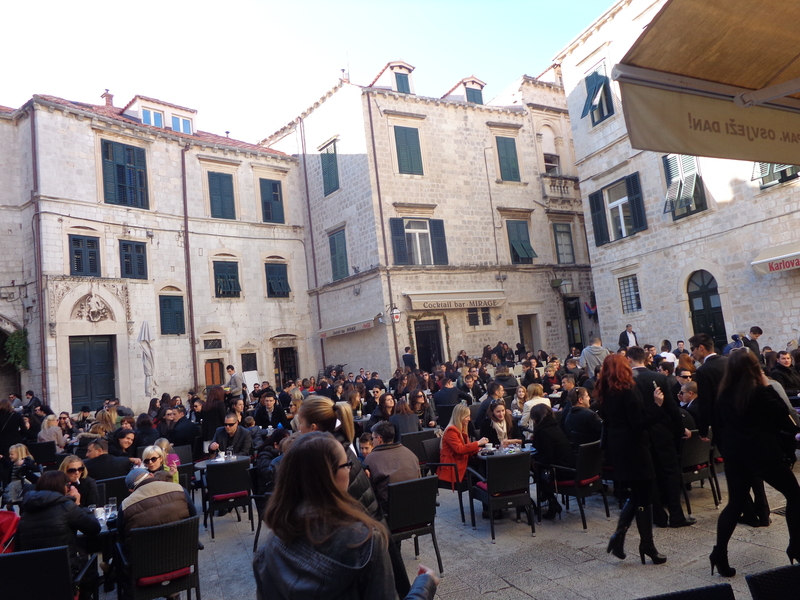 Old Town Dubrovnik was incredible (supposedly Game of Thrones was partially filmed there). The castle was beautiful and wandering through the narrow walkways of the high castle walls on Christmas eve really felt like a dream. 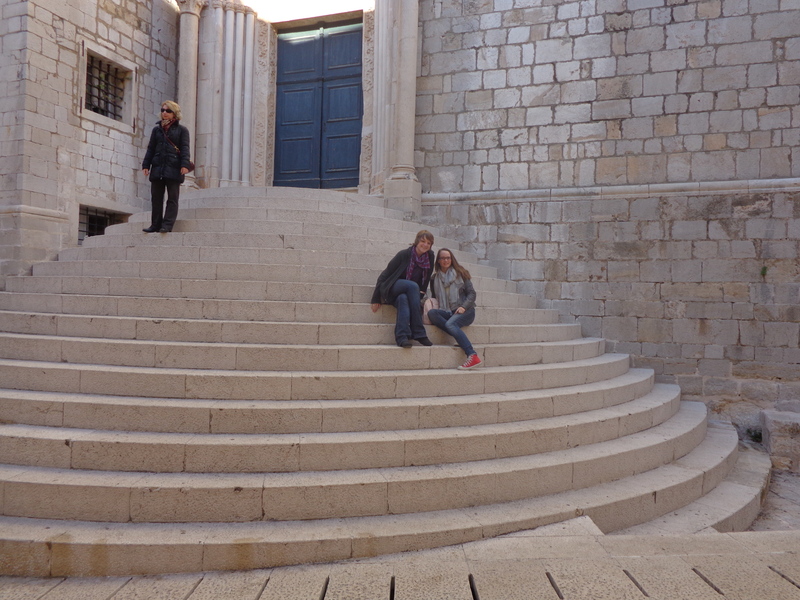 Makena and I stopped for a coffee inside the castle and were amazing by all the beautiful people surrounding us. Literally, everyone was drop dead gorgeous. Most of the people were decked from head to toe in fashionable black clothing and they looked like they had just stepped out of a magazine spread. The men were in clean cut suits and the women looked absolutely stunning; everyone looked like a model. I felt a bit touristy and out of place with my hot pink scarf and jeans. After old town we got back on the bus and headed for the village nearby. Makena and I hiked up a hill in the village to the local cemetery. It was very beautiful. We stopped for some beers with a few of the other volunteers who were on the trip. And of course we played around, took some jumping photos, and did some yoga. Even though I was miles away from home on one of the biggest family holidays of the year I was lucky enough to have the opportunity to Skype with several members of my family. Makena and I spent Christmas eve in our warm hotel room (so blessed) listening to Christmas music and watching the fake fire on the flat-screen tv. I guess it’s the next best thing to an actual fire?! Met an adorable cat basking in the sun. All the animals were so friendly in the castle! The square where we stopped for coffee. 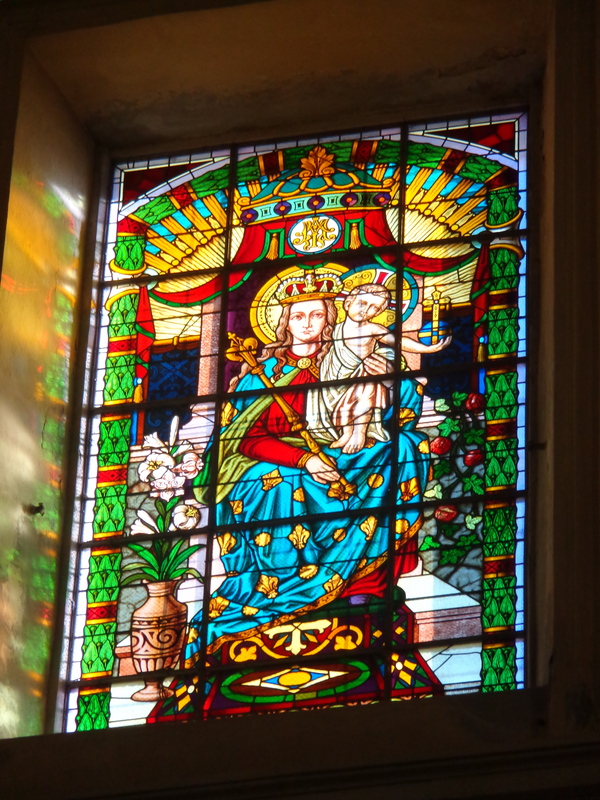 Stain glass windows in the church. 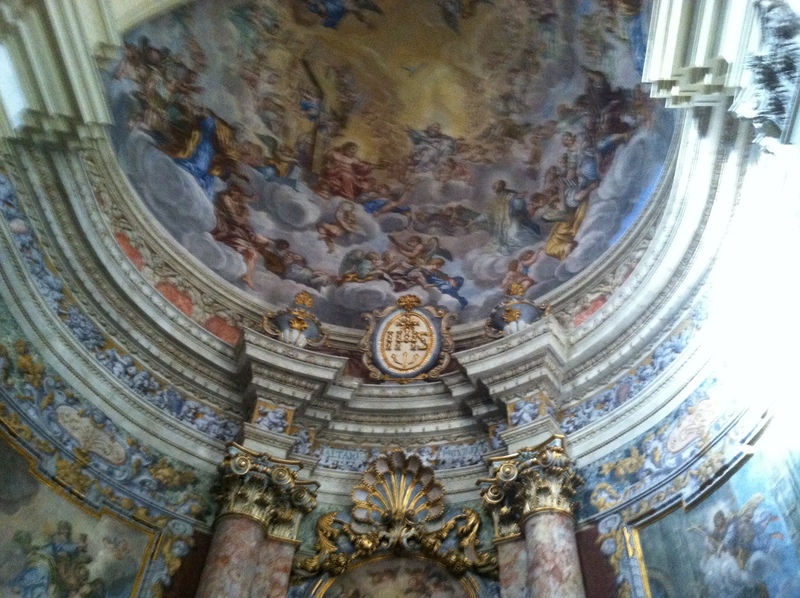 The church paintings were stunning. On our way to the village. 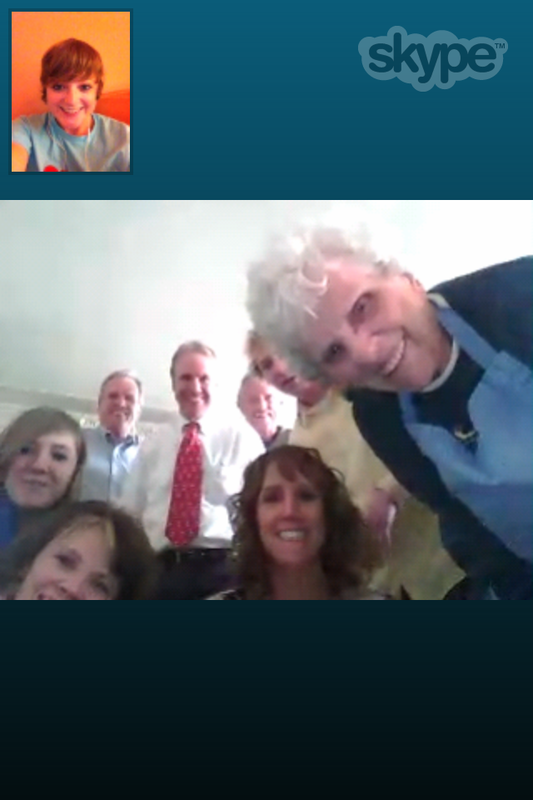 Christmas eve skype session with my wonderful family! 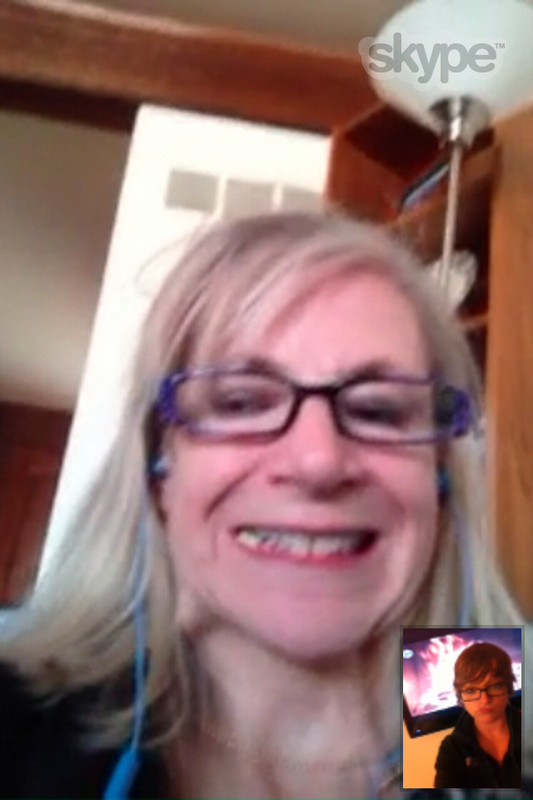 Skyping with my mom! You can see the fire on tv! 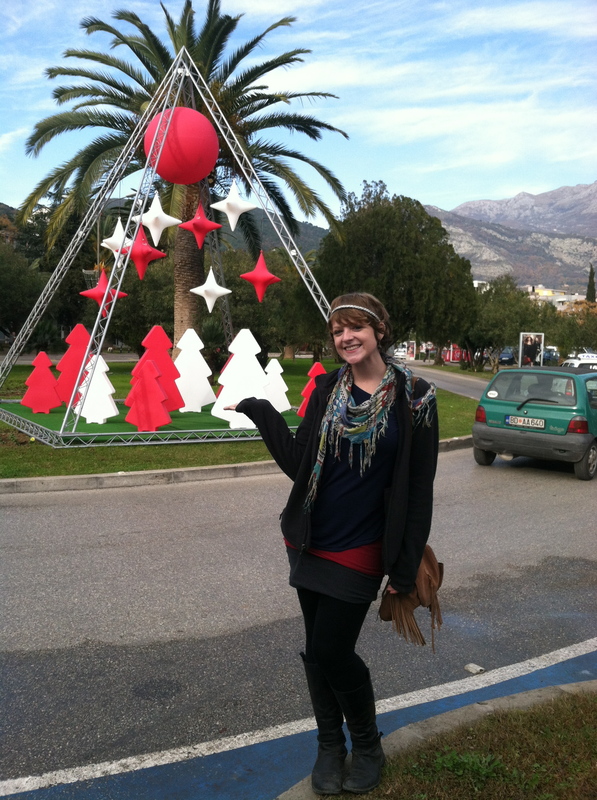 The third day (aka Christmas) we traveled back to Albania. 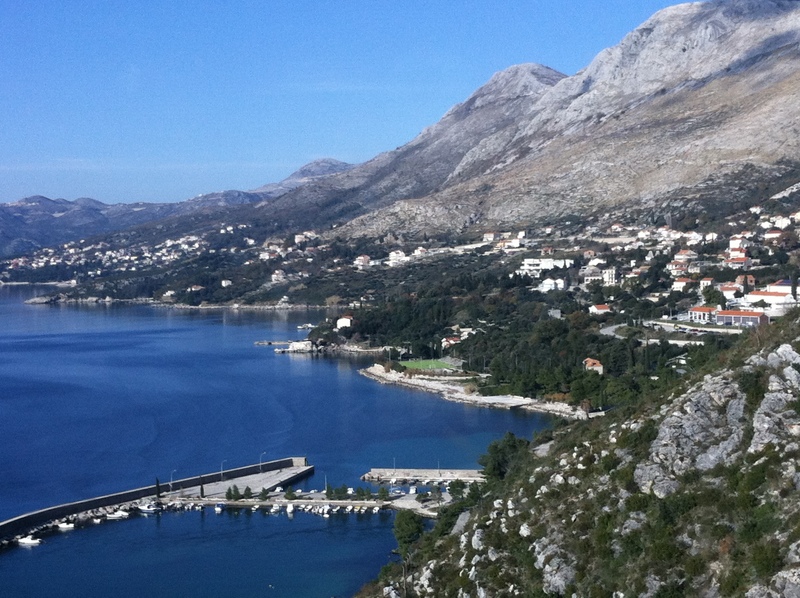 We stopped in the quaint town of Kotor which overlooks the bay. It was a beautiful town and the bay was breathtaking. 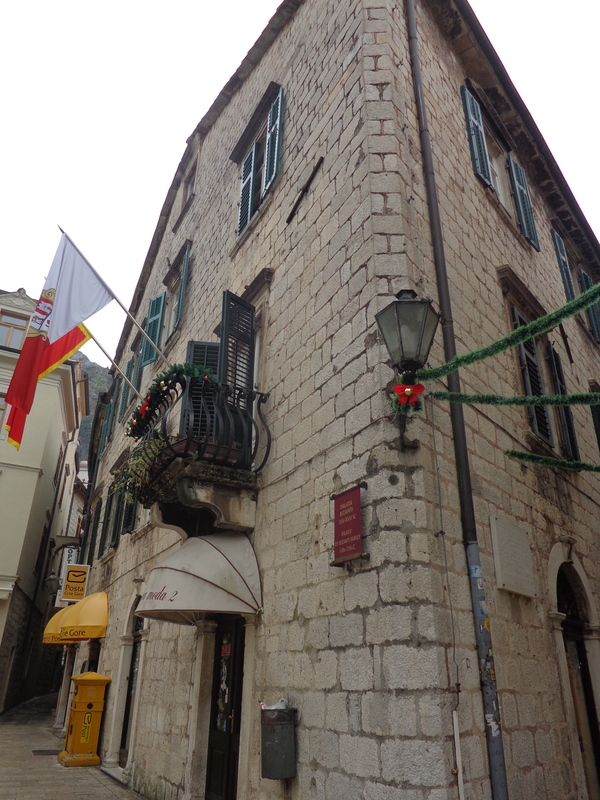 Kotor also had another Old Town area that we explored and of course we sat down here to have another coffee. 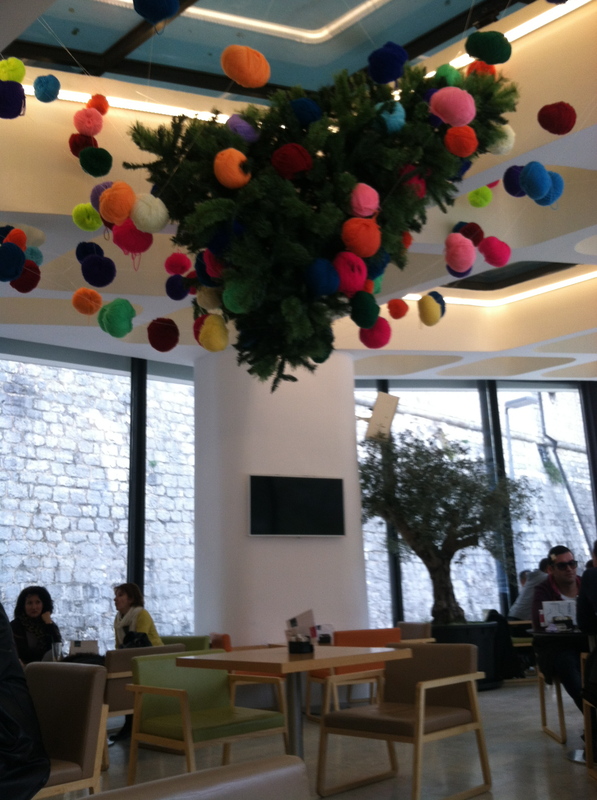 We actually found a posh little coffee shop that had modern art and even had a Christmas tree hanging from the ceiling – definitely my kind of coffee stop! 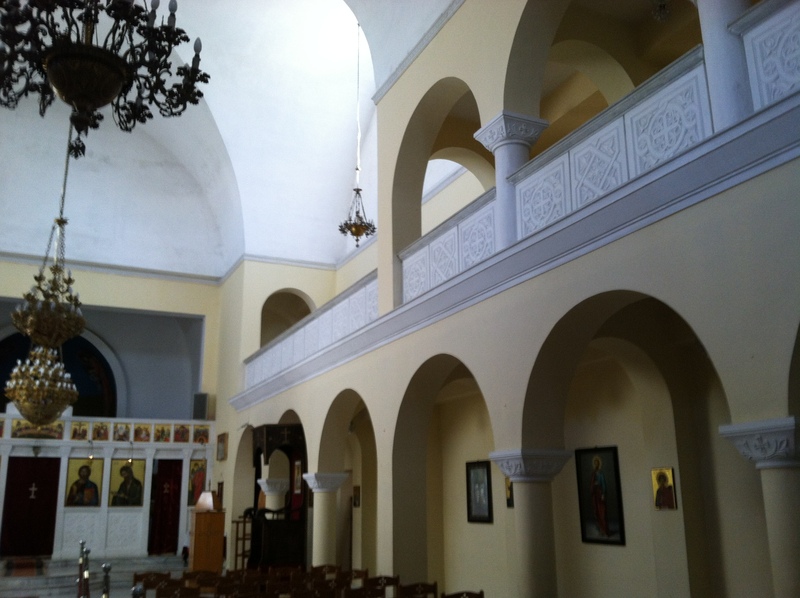 One portion of the bay contained a church and a mosque next to each other on separate islands. I cannot begin to explain how gorgeous it was. Once we got back to Albania, Makena and I decided to celebrate Christmas right with Chinese food and a heated hotel room. It was a wonderful holiday and I had so much fun spending time with Makena. We don’t get to see each other often because we live somewhat far away from each other, so this was a great experience. Now I can add two more countries to my list of places that I have visited! 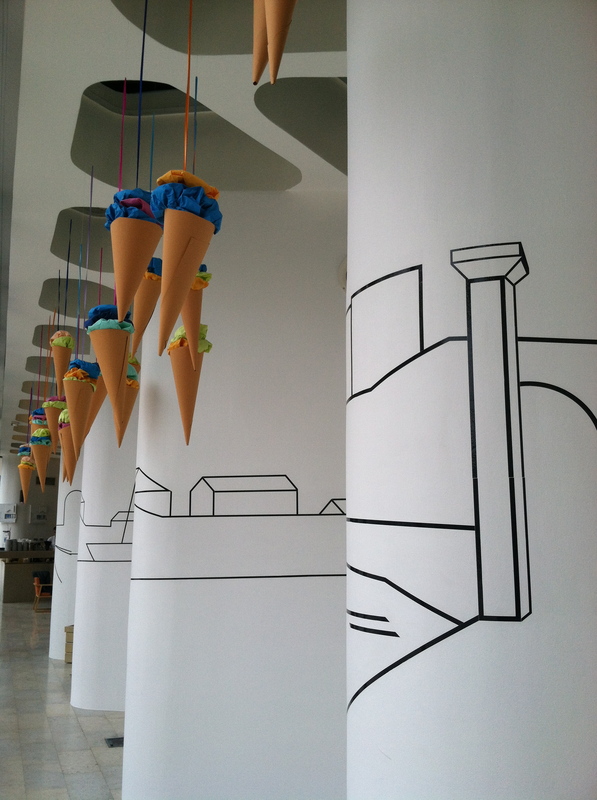 Some of the modern art in the cafe. 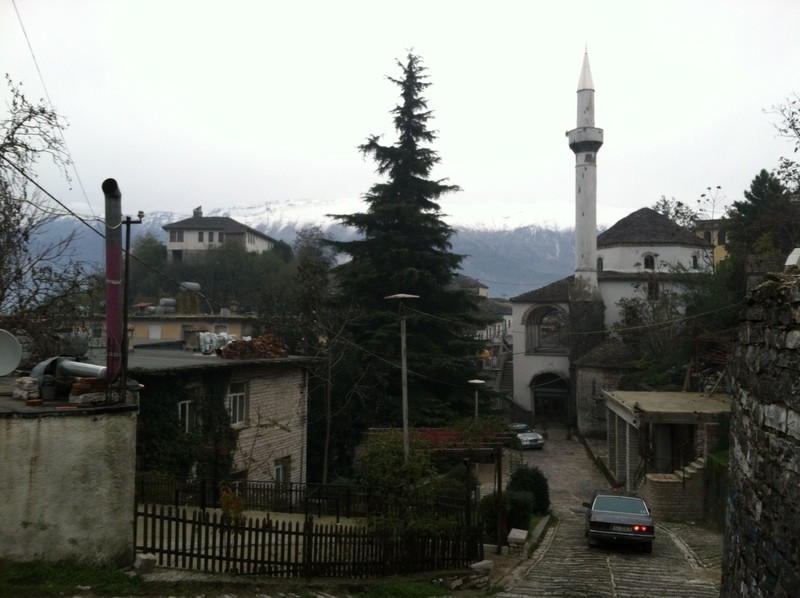 Random culture note: In Albania many people do not celebrate Christmas because their are many Muslim citizens that reside here. Many Muslim families however still buy Christmas trees and acknowledge Santa Clause. Instead, these items are associated with New Years and many people give New Years gifts instead of Christmas gifts! Here is a commercial car for the Town Hall in my city that has a picture of Santa and the phrase “Happy New Years!” It is interesting how these traditions can vary across the world! 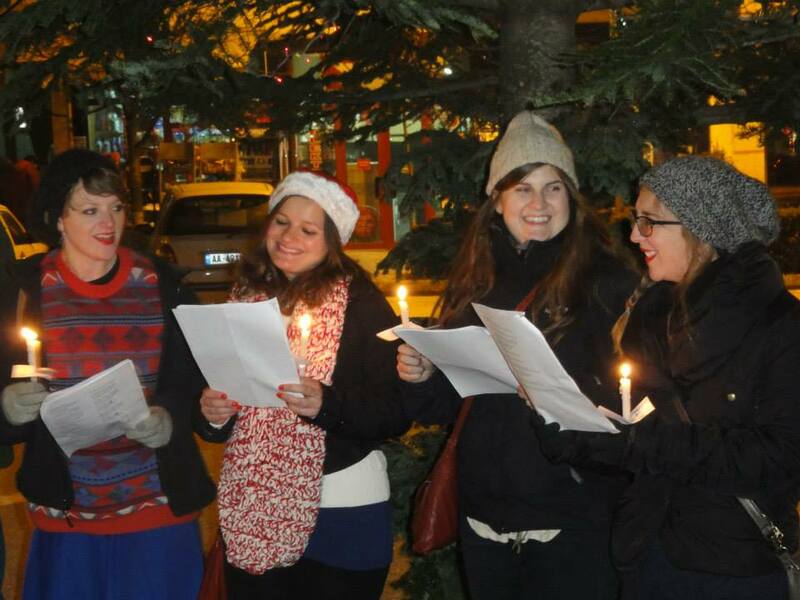 As Christmas neared in Albania the volunteers in Librazhd, Brendan and Mike, decided to spread the holiday cheer around their town with some classic Christmas carols. 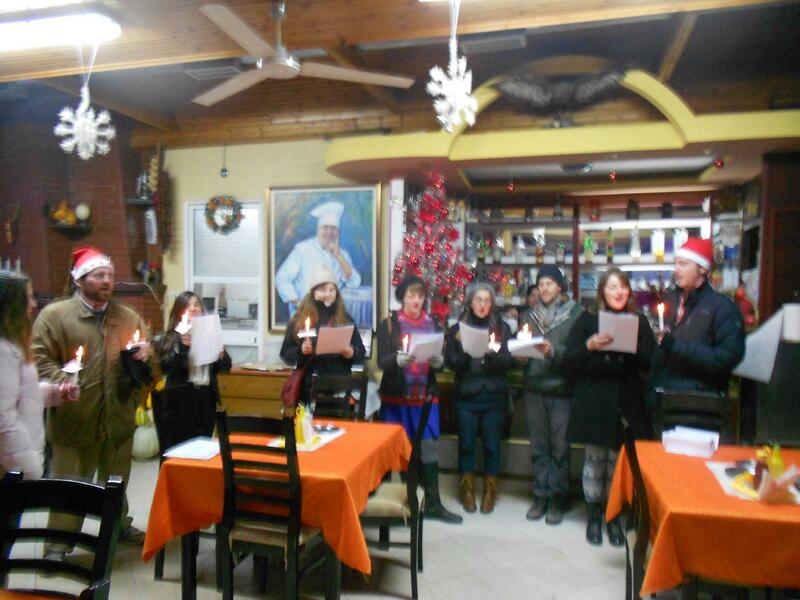 A group of eight volunteers came together to show off their vocal skills to some host families and restaurants in the town. Brendan and Mike printed off some of the best holiday carols including: Rudolf the Rednose Reindeer, Silver Bells, Have Yourself a Merry Little Christmas, Frosty the Snowman, We Wish You a Merry Christmas, Santa Claus is Coming to Town, etc. 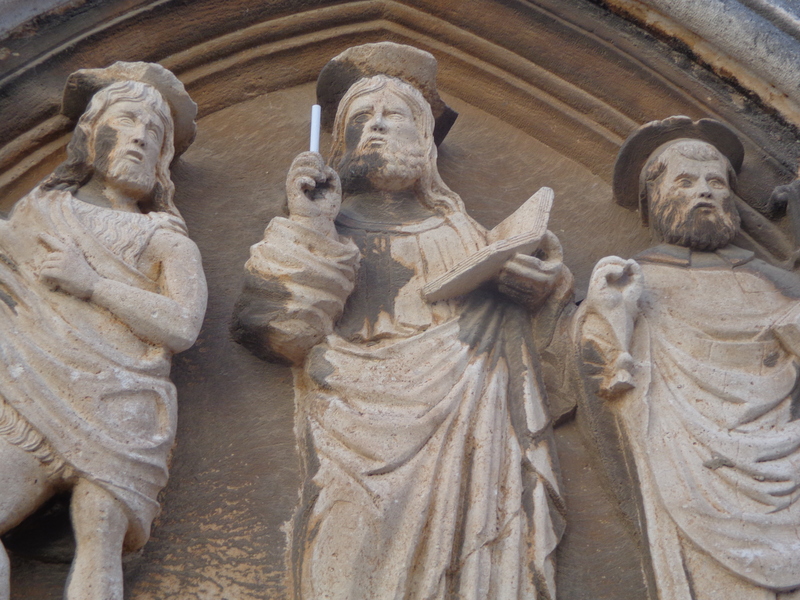 They also found some candles for all of us to hold while we were singing. It was legit! Back in America when I was younger I really enjoyed singing and every year I looked forward to being part of the Christmas carol pageant at a local church near my Grandma’s house. So you can imagine that when I was offered a chance to participate I was pretty excited. I haven’t actually gone around to houses to carol in quite a long time, so I was looking forward to singing my heart out. I was also curious what the community members reactions would be because caroling isn’t exactly popular or even known here. 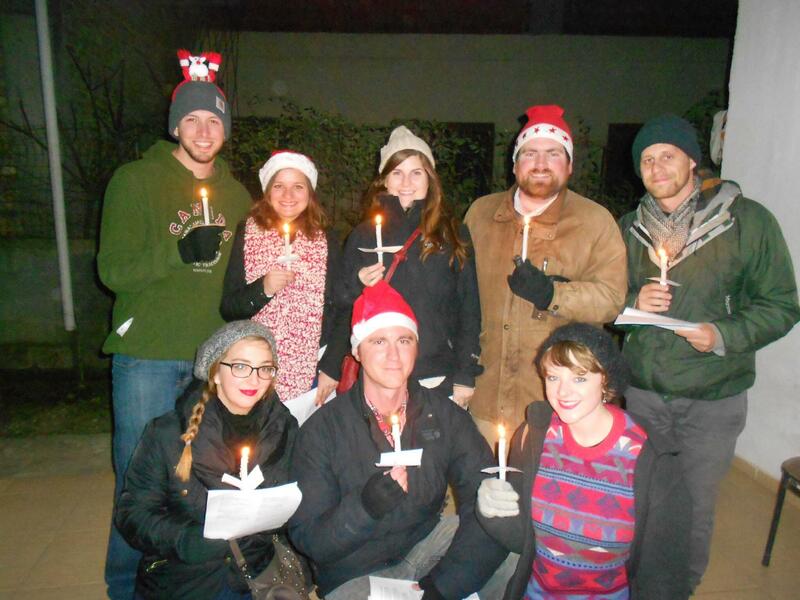 We started at the north end of town and sang to a family that has hosted several volunteers during training. After that we hit up several coffee shops, restaurants, and stores. 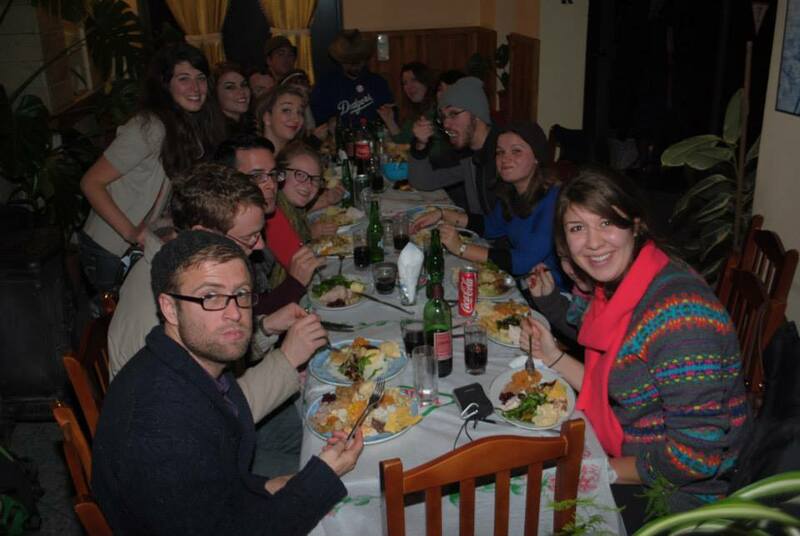 We sang to another host family and ended up finishing off at my favorite restaurant in Librazhd, Bicaku – the restaurant where I spent Halloween. 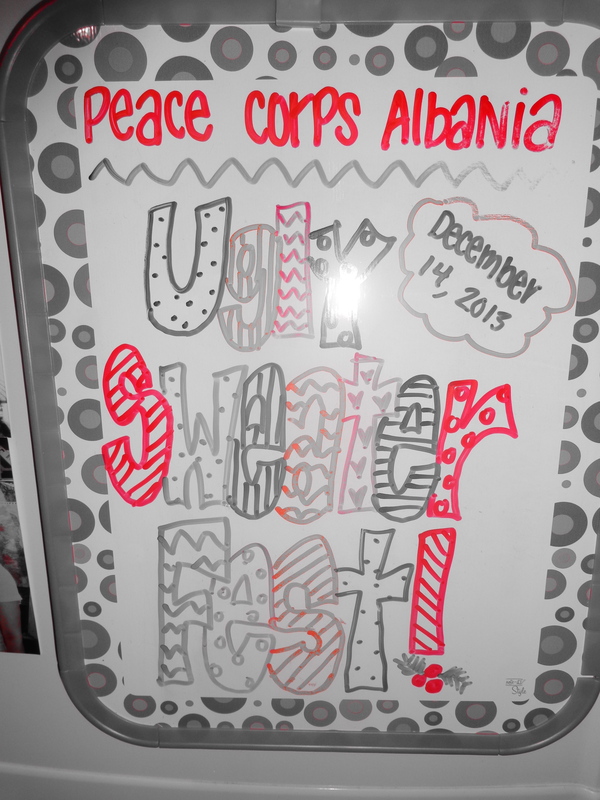 Overall it was a great experience and the Albanians really seemed to enjoy it. I am not quite sure if we had perfect pitch, but that wasn’t the point. 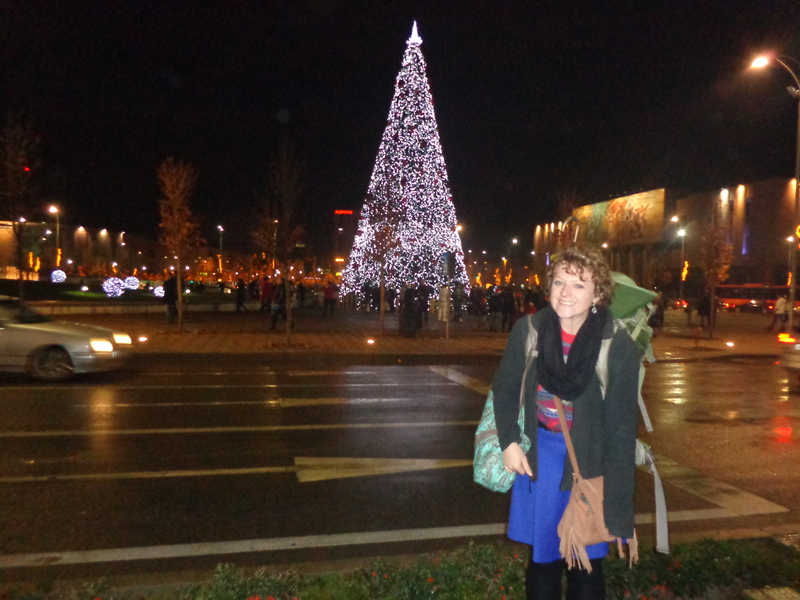 The point was to spread the holiday spirit and cheer, and to bring a little bit of American culture and tradition to Albania (hello, Peace Corps goal #2). 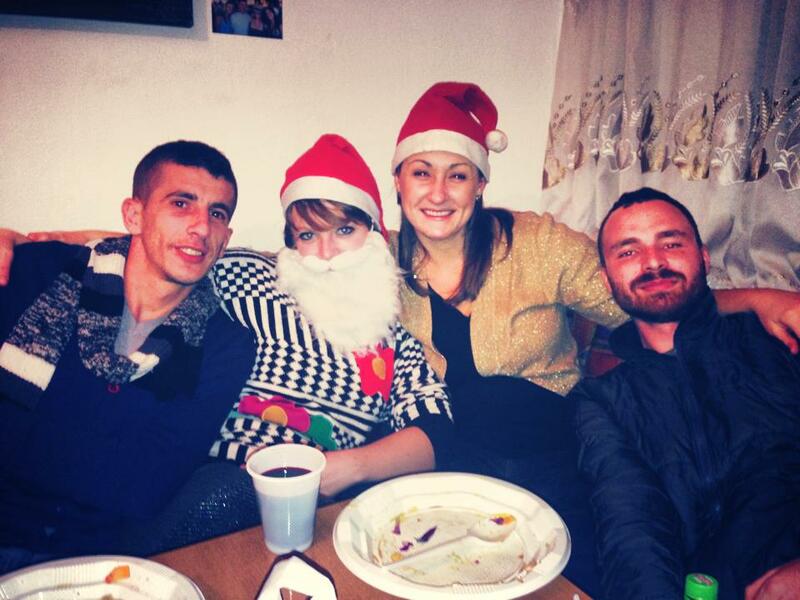 Happy holidays from Peace Corps Albania. The group of us in front of a host families house. 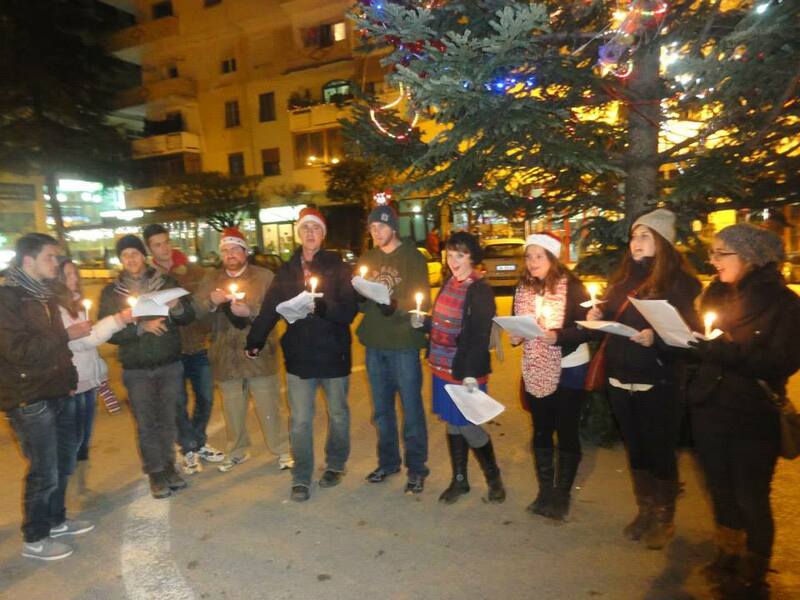 Singing in the town center. Ending the night off singing in a local restaurant. I opened the package with my site-mate Kate and we were in awe with all the amazing goodies sent from our secret supporter. The box was full of spices, sauces, chocolate, dressing, and of course plenty of sweet and low – my favorite! I couldn’t believe that a stranger would send such a thoughtful package. Your kindness has filled me with tears of joy and happiness. These past few weeks have been rough for me with the holidays coming up and being so far away from my family and friends for the first time, but this package really made my day. I cannot express how grateful I am to you, my secret friend; your kindness really helped remind me of the holiday spirit so far away from home. I can’t even express in words how much this meant to me and how grateful I am for your support. Thank you again, kind stranger. Random acts of kindness like this help remind me how beautiful this world really is. And how wonderful people in the world are. 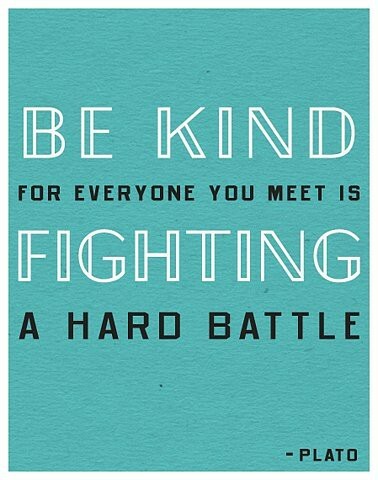 I will continue your kindness and pay it forward. 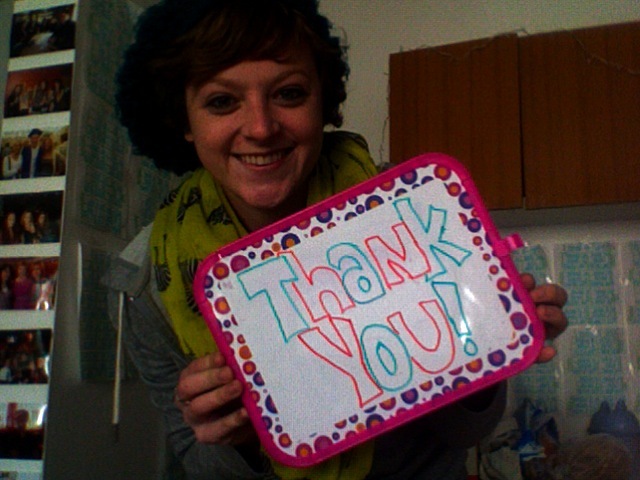 I am going to share this fantastic gift with other volunteers like you requested. Happy holidays!! I am sending you positive energy and thoughts! 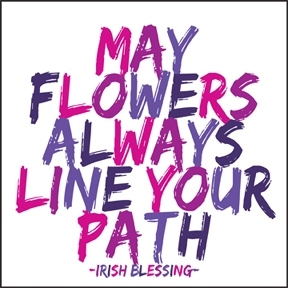 Here is an Irish blessing for you. THANK YOU SO MUCH!!! 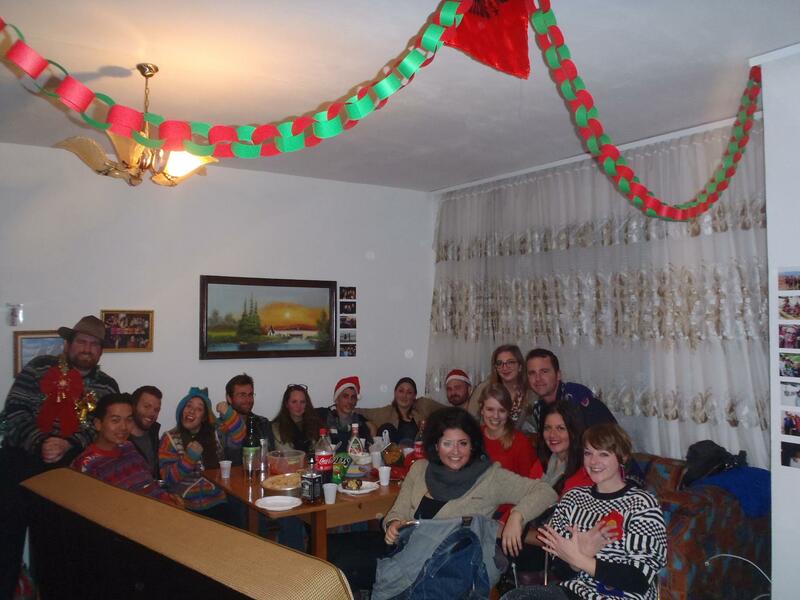 This past Saturday I held a holiday dinner get-together for some of the other Peace Corps volunteers at my house. I was really excited to have other volunteers come to my site and to my house because I have no had very many guests at my house before. Before people came over I decorated the apartment with some holiday cheer. As I mentioned before, I bought a little Christmas tree from a small shop on the corner near my house. 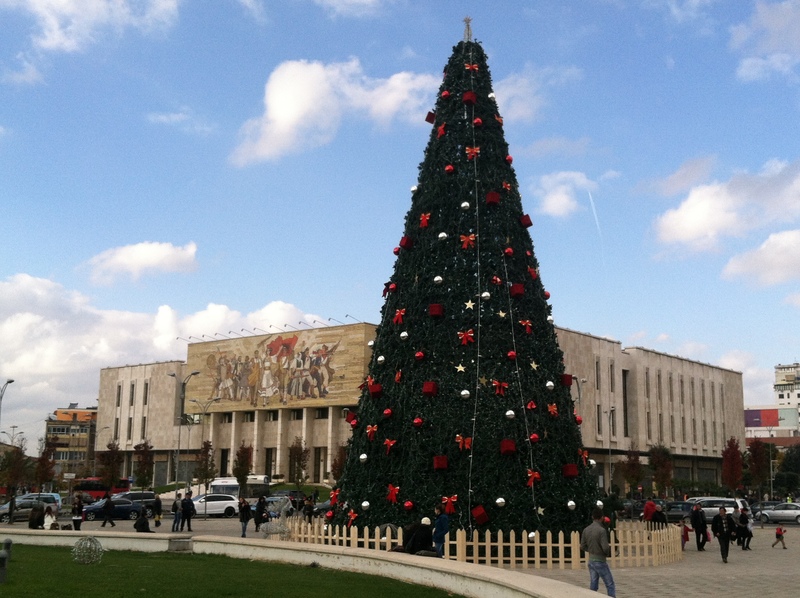 Even though I live in a primarily Muslim community, many people still celebrate Christmas or buy a Christmas tree (known as a New Years tree in Albania – all inclusive). Also, one of Kate’s students mentioned that many of the community members who are Christian live in my corner of the neighborhood near the church. Once I had the tree I made decorations out of old books that I am never going to read (it’s good to recycle) and a fun little red and green circle chain. I also christened the tree with disco ball ornaments, colorful blinking lights, and other cheap random ornaments that I splurged on with my volunteer budget. 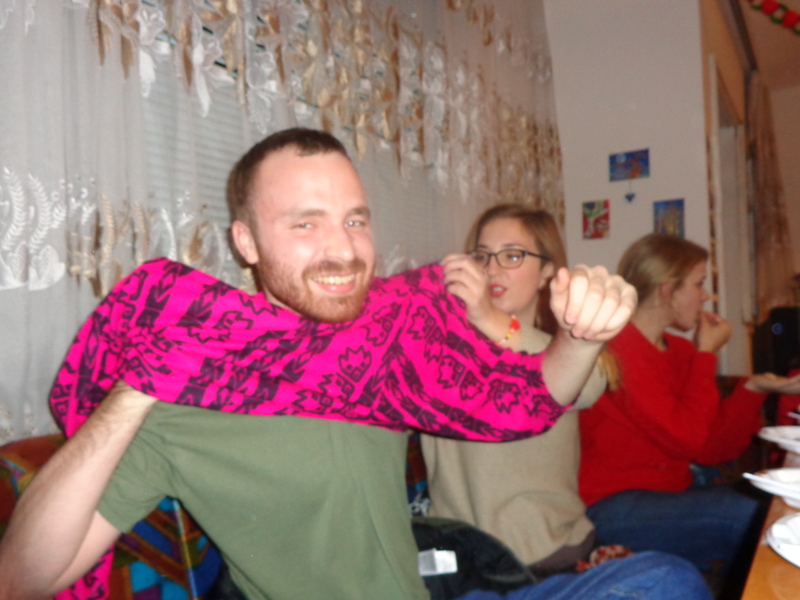 The theme of the party was “Ugly Sweater,” which is a common party theme in America around Christmas time. This was the perfect theme for Albania because once the weather turns nippy the second-hand markets are stocked full of ugly sweaters. I happened to find an amazingly hideous sweater while shopping with my counterpart one day at the treg. It was a black and white geometric pattern with giant flowers on it – so obnoxious and unattractive! Even though it is ugly, it is fairly warm so I will definitely get some use wearing it around my sub-zero apartment this winter. My counterpart actually thought the sweater was so dreadful that she asked me to never wear it to work (haha I guess it is somewhat embarrassing). Volunteers started arriving Saturday morning with delicious baked goods and food for the party. 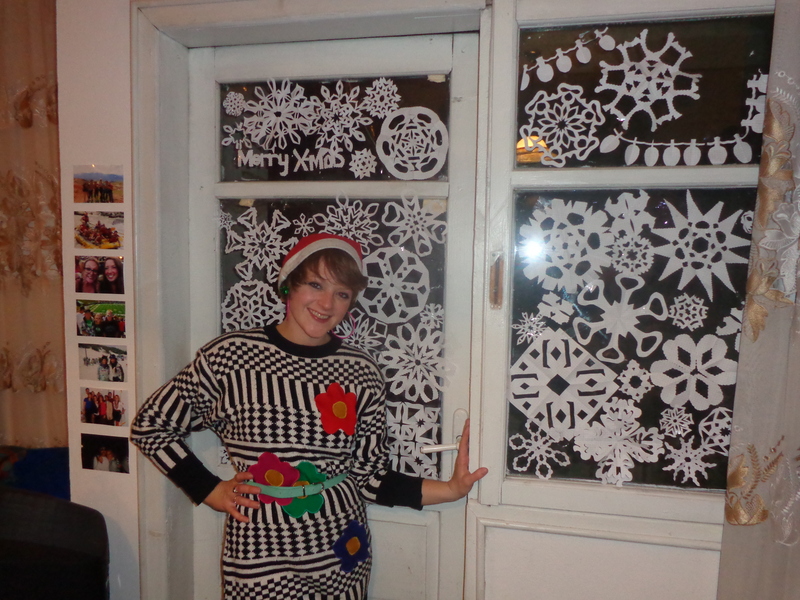 Once more people came, we began making snowflakes – it is fun to do childhood crafts, especially holiday crafts. Luckily, my wonderful friend Mary is the master of making snowflakes and she showed us all how to make beautiful 6 pointed snowflakes. Now my apartment window is completely covered with our decorations! I think I may even ask the neighborhood kids to come over something this week so that we can make some more for some of the other windows in my apartment. It would be a fun activity for us to do together, and they love seeing inside of the mysterious American’s apartment. As far I food went, we had plenty of delicious baked goods: an oreo no-bake jello dessert (thank goodness for care-packages from America), an home-made apple pie, sugar cookies, Kate’s birthday cake from her students, and some other goodies. I attempted to bake a Mexican casserole, but something was a little off. 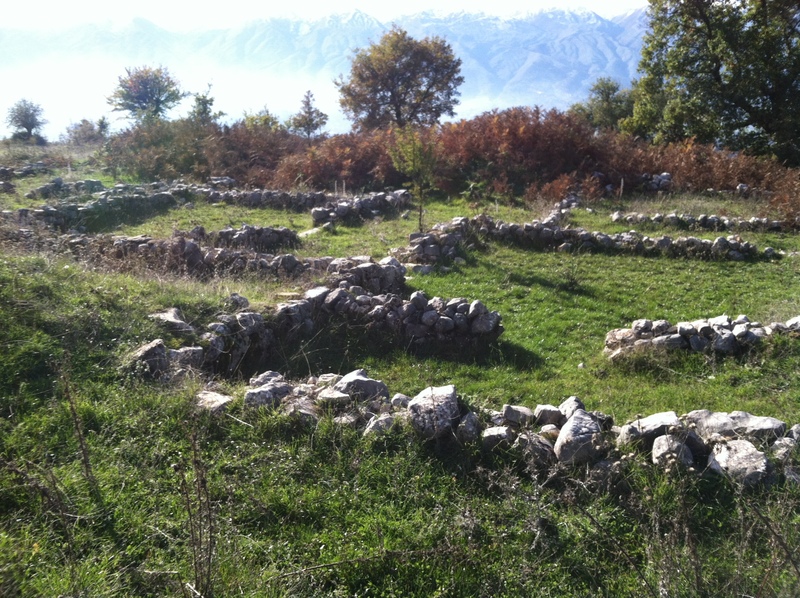 I wish I could cook like some Albanian women – they are amazing cooks! Maybe sometime in the New Year I can learn some recipes from ladies in my workplace. 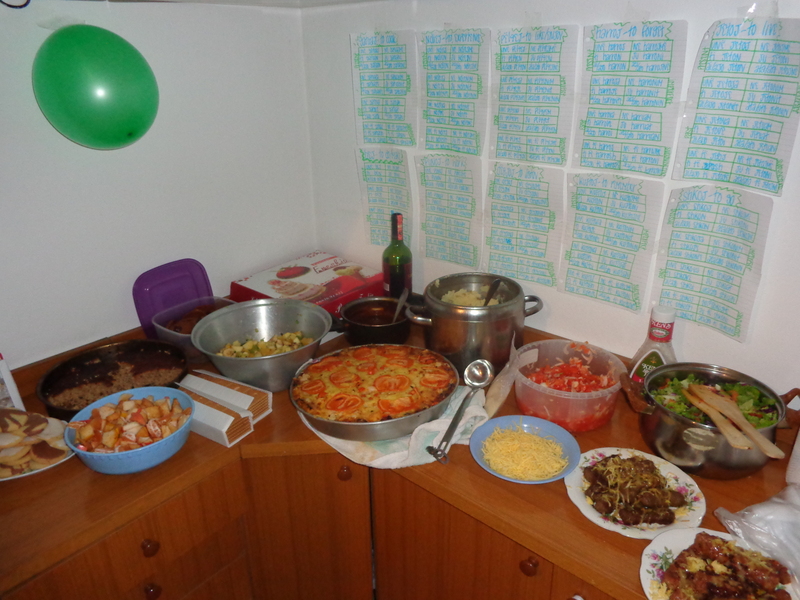 We also had some other foods too, so no one went to bed hungry. It was a quick little party and all the volunteers were off back to site by 10am the next day! One of the nice things about hosting a get-together is getting to keep the leftovers and having others to help with the clean-up. It was a nice little party to celebrate the holidays before many of the volunteers begin traveling around Europe and back home for Christmas/New Years vacation. 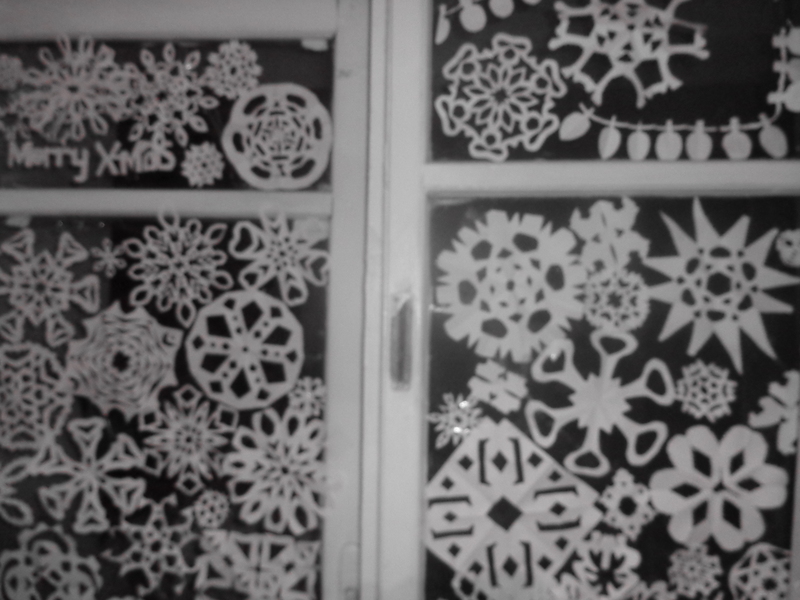 We made a lot of beautiful snowflakes. My christmas tree and some of the white elephant gifts. Check out the UGLY SWEATER! PS: Want to give a big holiday shout-out to my grandma and aunt. 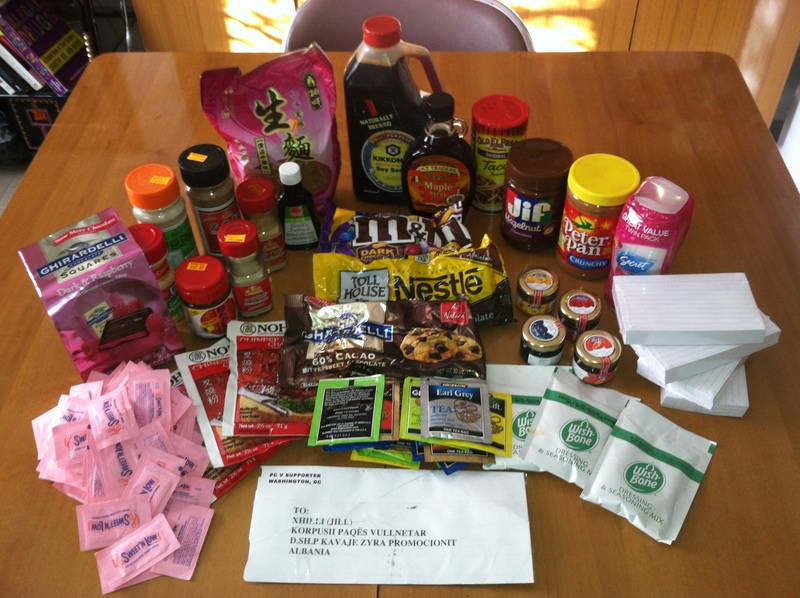 I just received your wonderful care-package and it made my day! Thank you so much!! I am so happy to have American coffee again and I can’t wait to use all the craft supplies with my neighbors. Ever since my blog post went viral several months ago I have received an onslaught of negative comments in many different avenues of social media including: youtube, facebook, and of course wordpress. Everybody’s a critic. My friend Dan put it real simply, “Jill F@#$ the haters!” Sometimes I wish it was as simple as just forgetting about it, but some of the comments that I have received have geniuely hurt my feelings and made me reevaluate who I am as a person. All of the cyberharassment that I have received has been debilitating to my service here sometimes. It has been hard to cope with the negativity, especially without the comforts of home and my support system there. All of this consistent negativity has affected my mental health – I am not even going to deny that some of these comments have made my cry and not want to get out of bed or leave my apartment. I think they bother me so much because all of the observations do not describe me at all, and for someone to see or read something about me online does not give them the inside look at who I am as a person. What I have come to realize from all these negative comments is that those who are taking the time out of their day to bring me down are really just unhappy with their own lives. What is the reasoning to harass someone online that you don’t even know? Maybe we can all use this as a lesson to remember that NOBODY IS PERFECT and we should stop being so quick to judge people in our lives. I just urge readers, people in general, to please think twice before putting negative energy out in the world (online or in person). Everyone has feelings and while you are entitled to your own opinions, it’s important to think about if your pessimistic opinion is constructive or if the sole purpose to to put someone else down. I am choosing positivity over negativity. 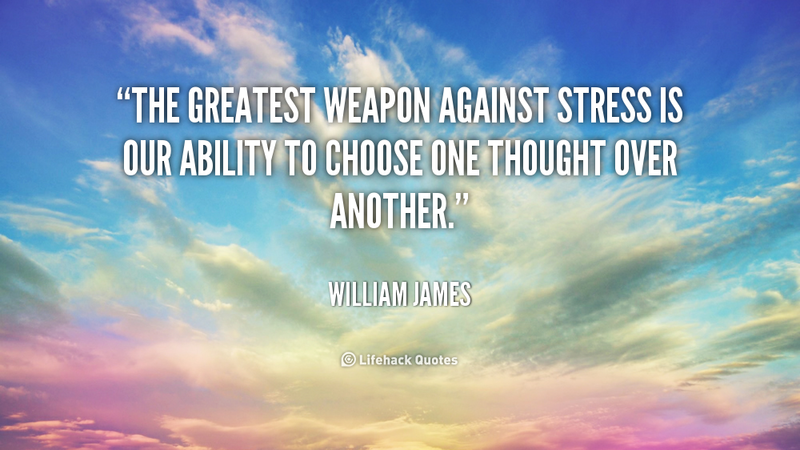 I am picking positive thoughts over the thoughts of self-doubt, loathing, and sadness. Maybe the mean blogger is having a really hard time with life right now. Maybe the thoughtless commenter is unhappy and cried herself to sleep last night. Maybe not. Maybe they are mean and thoughtless all the time. Either way that can’t be an easy way to live. I am choosing compassion over anger. The world has enough angry people in it, and in the end I am not going to change how others view me. I can’t make people see me, forgive me, love me, or understand me. I can’t make anyone happy, open-minded, or nice. The only thing I have complete control over in this life is how I feel about myself. And I am choosing to love myself, despite all my flaws. This has not been an easy road, but it sure has been worth the ride. These experiences have brought me to the major issue of “Cyberbullying” that our society is facing today, especially amongst the youth. 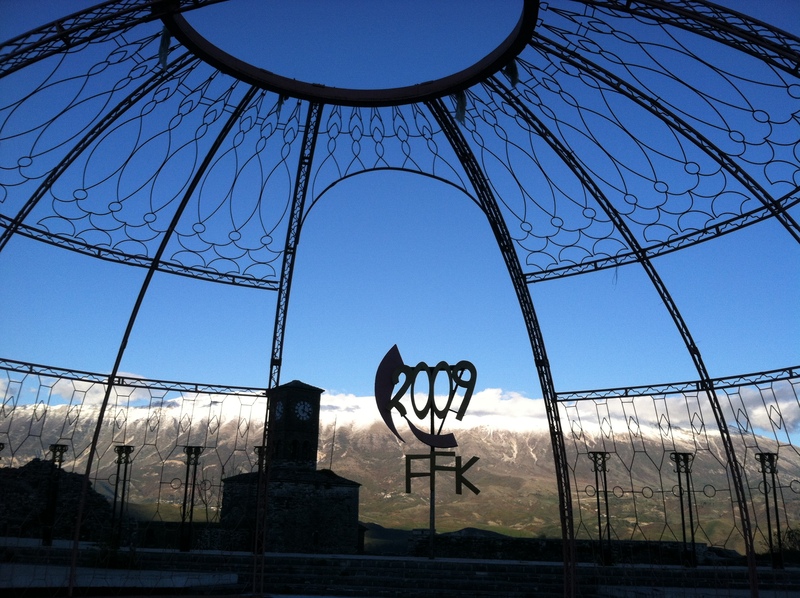 Social media and widespread use of the internet is continuing to grow in America and around the world, especially in Albania. 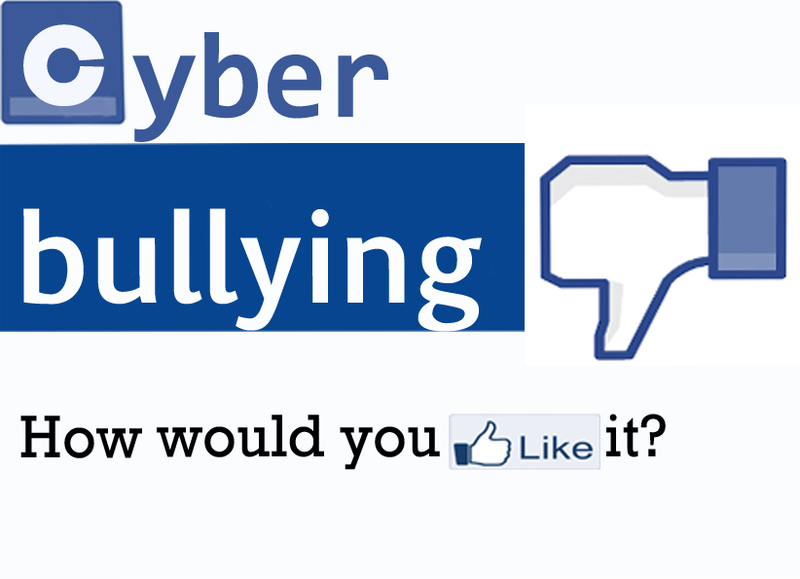 Cyberbullying/cyberharassment is motivated by many factors including: boredom, revenge, jealousy, bigotry, righteousness, fear, anger, and to receive attention. It is time for me to stand up for myself and say ENOUGH IS ENOUGH! If you do not have something nice to say to me, then keep it to yourself. If you still find the necessity to continue to harass me, then that is part of your own insecurities and issues. All previous negative comments have been deleted and future negative comments will not be posted. If you’re interested in addressing cyberbullying in your community check out this site for more information on ways you can volunteer and help out. Last week was one of my favorite weeks of Peace Corps thus far and there really is no particular reason why it was better than the others. I think that I am finally starting to get to the Peace Corps stage of Adjustment. 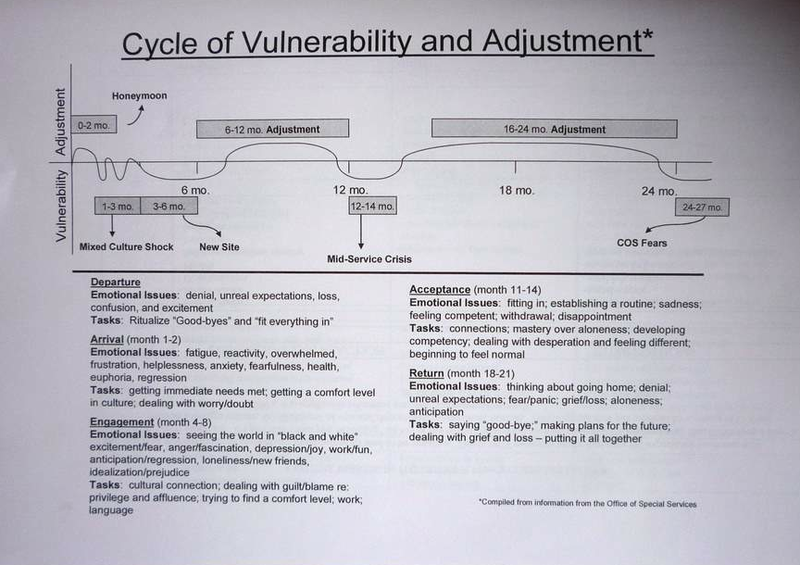 During our training, Peace Corps was nice enough to provide us with materials, including this lovely chart of vulnerability and adjustment. Oh the roller coaster of emotions volunteers face all around the world. We even have nice charts to explain volunteer’s bi-polar behavior. 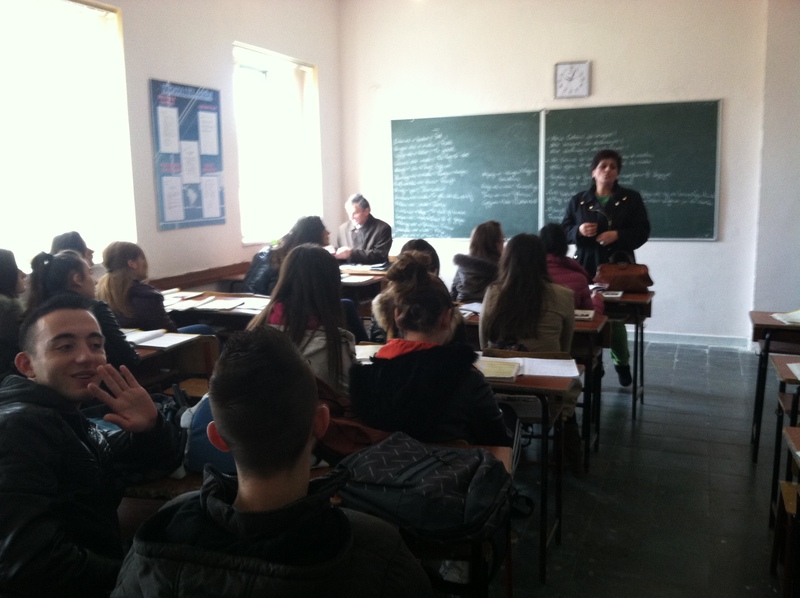 I began the week on Monday giving HIV/AIDS lessons with my counterparts at the high school. Instead of working with my regular counterparts, I shadowed another lady at the D.Sh.P who does promotion only at the schools (rather than the whole community like my official counterpart). She gave some lectures to the students regarding HIV/AIDS information and I took some photos for the Ministry of Public Health. Once we returned to the office, I suggested that we add some activities, posters, etc. to our lessons for the rest of the week in order to help keep the students more engaged. She was very receptive to my ideas, so I offered to make some posters for our lessons on Tuesday based off of the Peace Corps Health Lessons manual. I was so excited to have my ideas heard. Often times, I feel like my ideas are not necessarily taken into consideration for one reason or another, so it felt nice to have positive feedback regarding changes. After our morning lessons, I had my English course in the afternoon at the Cultural Center. I developed a Powerpoint presentation surrounding the American holiday Thanksgiving. It was nice to have a successful, fun lesson that also brought in some American culture. 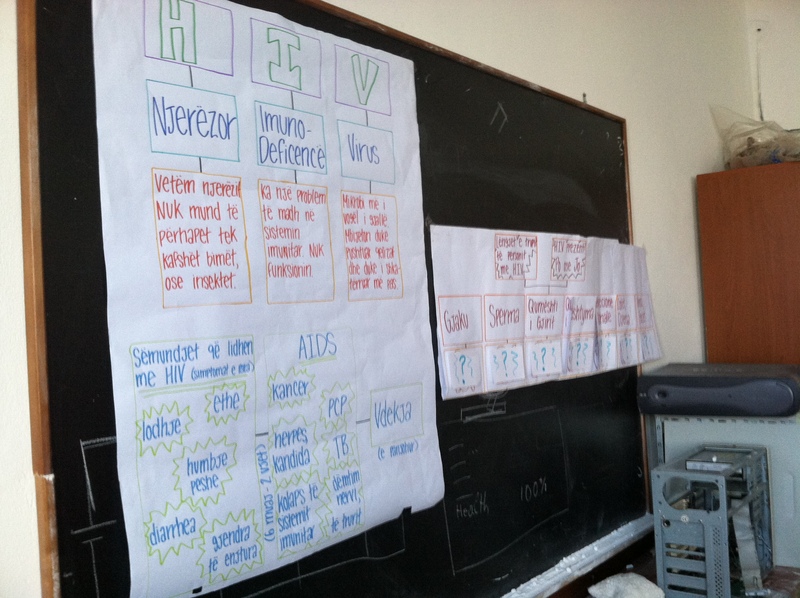 Asking the students what they know about HIV. On Tuesday, I went to the technical school with this other lady at the D.Sh.P to implement our new and improved lesson. At first, she gave her normal lecture, but after she was done I was able to interact with the students a little and give my portion of the presentation. This was the first time that I was able to interact with the students during the lesson and that meant a lot to me. I hope to continue this practice throughout my second year volunteering in Albania. Things are continuing to look up! 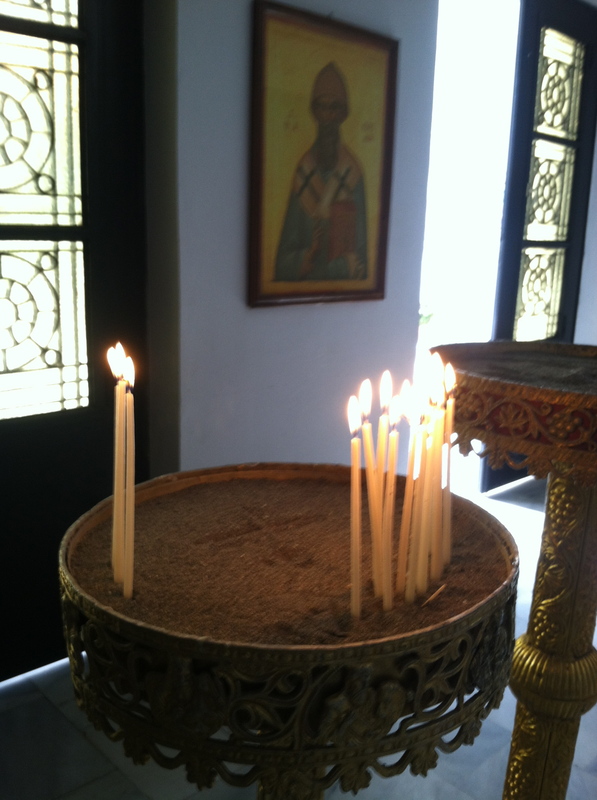 Once we finished our lesson, we went to the local community church so that my counterpart could give respect to some of her loved one through traditional candle lighting. It was very moving that she allowed me to come with her and partake in this tradition. She even gave me some candles to light on my own. 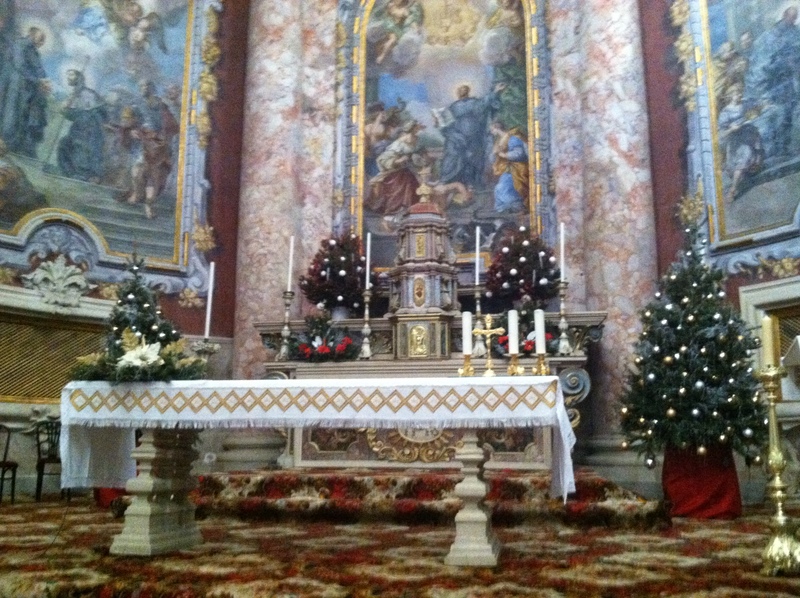 After we lit the candles we went into the church and my counterpart proceeded to kiss every painting inside of the church. 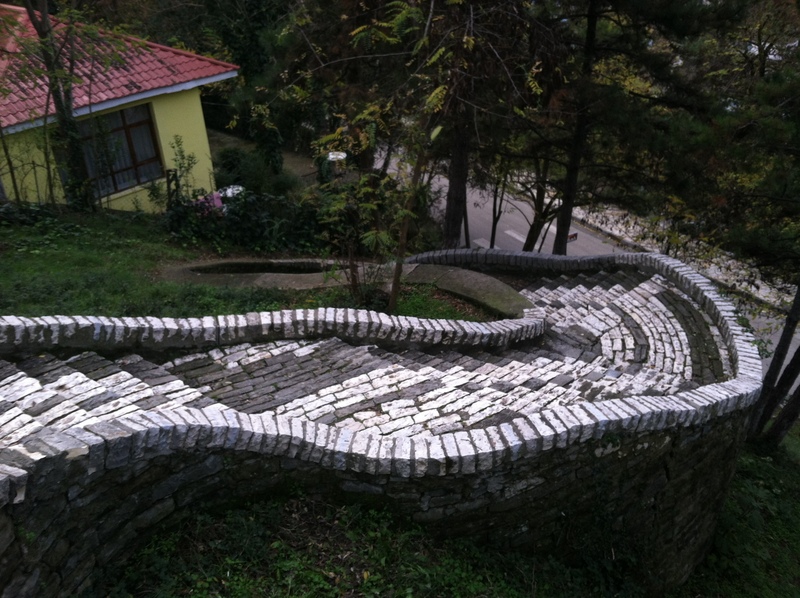 I really enjoyed seeing another side to Albanian culture. 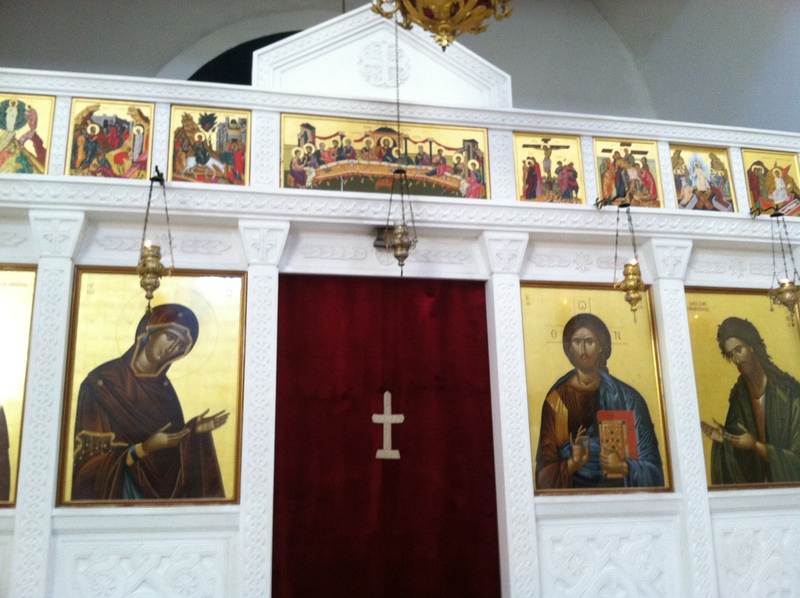 Even though I live in a primarily Muslim community, some of my counterparts/students attend the church near my house. One of these Sundays I plan on attending a service. They even have a kindergarten held there and I am pretty sure children go to day school there during the summer (it could be another possible avenue of work for me during those slow summer days)! Once we finished at the church, I helped her pick up fruits and vegetables from all the village workers so that she could prepare a nice lunch and dinner for her family. I ended my day making Christmas ornaments and crafting for the holidays. 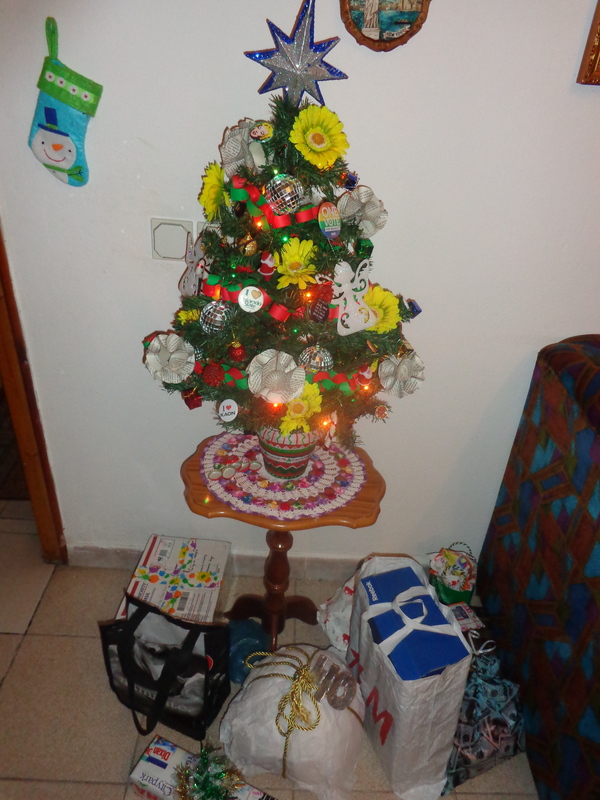 Luckily, I was able to find a cute little Christmas tree and some ornaments at a small shop near my apartment. There are not as many decorations in my town though because most of the citizens practice Islam. The posters were a nice addition to our lesson. Lighting candles for our loved ones. My counterpart kissing the portraits. 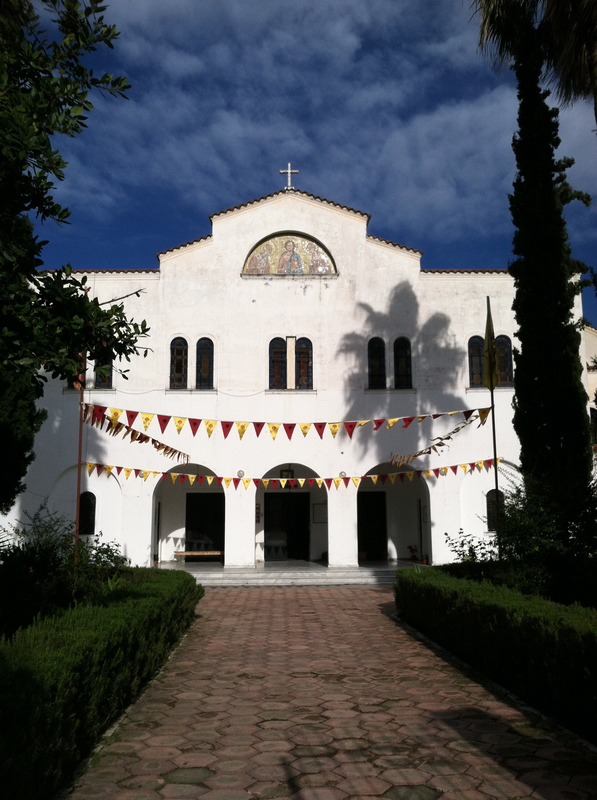 The church is not even a block away from my house. On Wednesday, we received a new director at the D.Sh.P. I have yet to meet him, but I hope to converse with him soon to talk about ways that we can work together to improve health promotion in my city. We decided not to give lessons on Wednesday because many of the ladies at the D.Sh.P wanted to wait around in case the director wanted to meet them. Of course, that did not actually happen – ska problem (not a problem though). Sometimes you just got to roll with the punches, and not doing much at work doesn’t necessarily bother me anymore. I want to do work, but I understand the restrictions and the culture better now than I did when I first began volunteering in this country. Do what you can, with what you have, where you are. I continue to remind myself things, along with the turkisk mantra “avash, avash” (slowly slowly). If there is not a lot going on at the Health Center for the day, I manage to keep myself busy with committee work, writing my blog, etc. I also began running today. I have never run outside before – ever! Back in America I was diagnosed with exercise induced asthma and the then thin Colorado air was less than ideal for a nice run. Since I now live in a more humid climate I decided pse jo (why not)?! Plus, I honestly have the time to begin working on myself and doing extra things just for me. Usually I am done with work anytime between 11am and 4pm, so often times I have the afternoons off to do whatever my heart desires. It was nice to begin running, although right now I still am nothing to brag home about. I will run for a couple blocks and then walk a bit, then run, then walk. Hopefully I can work up to running the 2014 Istanbul marathon next fall. We shall see. The cutest thing happened on my first run as well. As I was nearing the end of the first block I heard an older women cry out, “oooo goca” (oh girl) and I turned around to see an older woman about literally half my size limping with a cane struggling to get her fresh vegetables home. 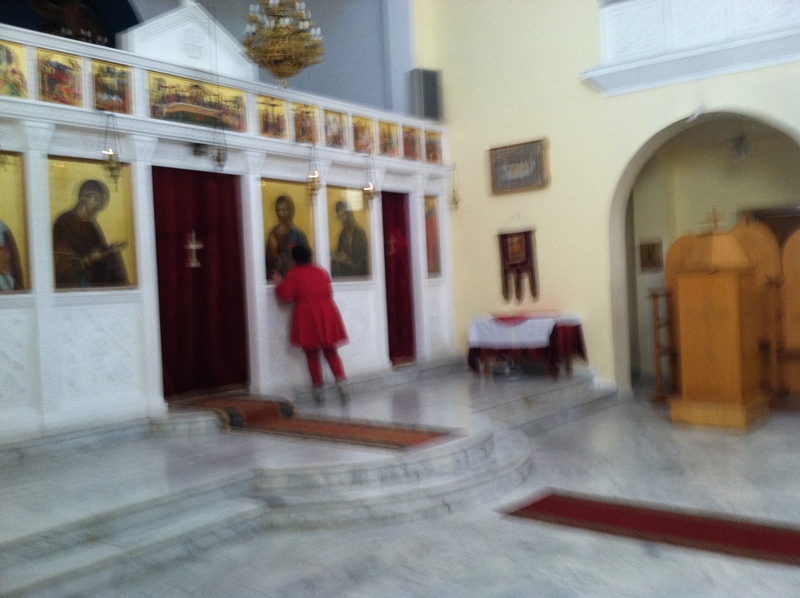 I asked her, “mund te me ndhimoj” (can I help you) and then quickly ran back to help before she could even answer. 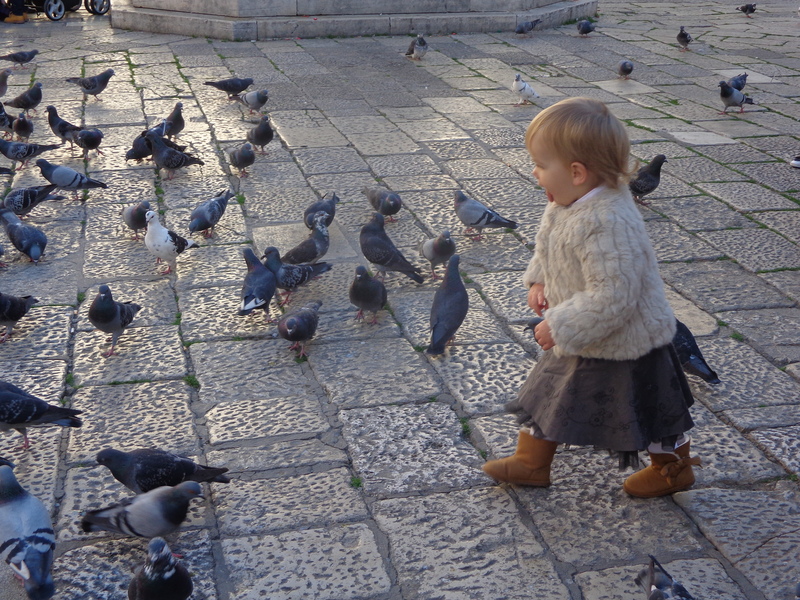 I took her bags and she immediately started spewing out a bunch of shqip that I could barely understand. I told her I was from America, which shocked her a bit because you don’t meet many Americans wandering the streets of my city. After we made it to her point of destination, she thanked me and I was off. It was really humbling to actually legit help an old lady across the street with her groceries. Usually that is only something that you hear about it stories. On Thursday I had a normal day at the Health Center. We didn’t really work on anything of significant important, but it was still a nice day with my counterparts. E went to the treg and they tried to help me find Christmas lights for my tree. Sadly we didn’t find any, but my main counterpart bought me an early Christmas gift. She gave me a cute, turquoise headband from the treg. I was very happy that she gave me this gift because sometimes I feel like my counterparts do not like me very much. I think that this is mostly just differences between our cultures and getting used to each other’s different working styles. I went on another run and felt an improvement from the first day… maybe the marathon is a possibility after all! 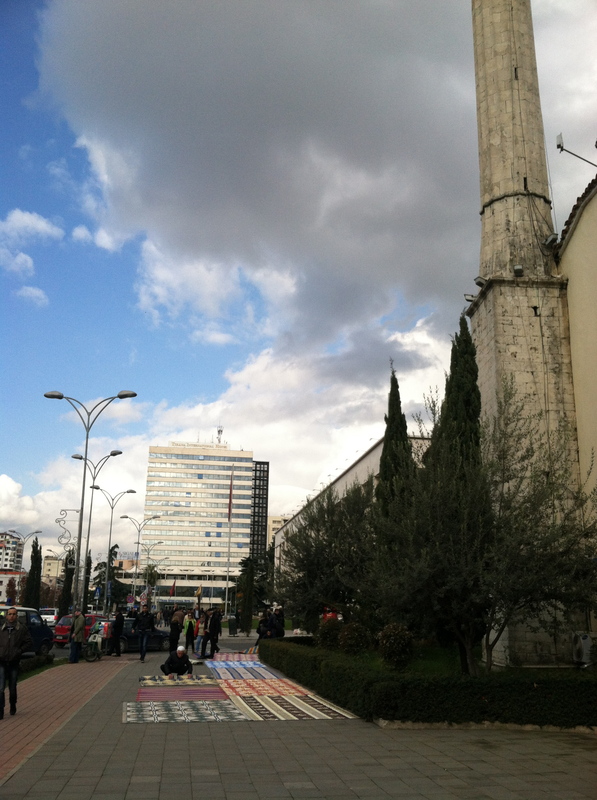 On Friday I went to the capital city of Tirana to get our mandatory annual flu-shot. Normally I do not get flu-shots, but as a government employee in a developing country we are required the get such things. I left my site early in hopes to make a 9:30am morning yoga class at a studio that I found out about via Facebook. I was extremely excited to attend a yoga class because I haven’t been to an actual studio to practice since leaving the states and I REALLY MISS my evening hot yoga classes. 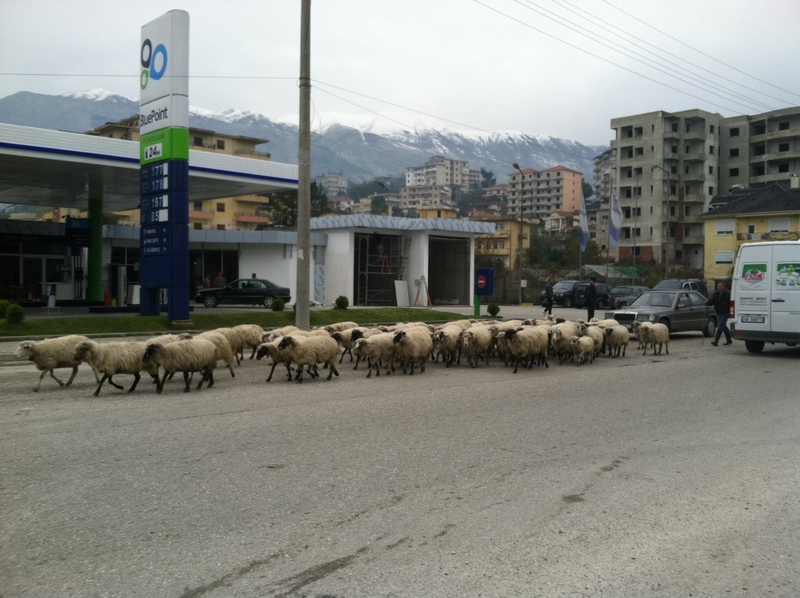 Sadly, traveling in Albania is not always reliable and it ended up taking a bit longer than normal to arrive in the capital. Even though I missed my yoga class, I was not upset. This was a nice moment for me because, in America, if I missed a yoga class I would get stressed and upset, but I have really cultivated a new understanding of patience and acceptance for the daily challenges that life presents. Instead of getting disappointed by the fact that I missed yoga, I looked at the situation as an opportunity to explore Tirana for the day. I ended up getting my shot, finding disco-ball Christmas ornaments, lights for my tree, and craft supplies to make cards for friends and family back home. It was nice to have a day off to myself to explore and do whatever I wanted without having to worry about anyone else. 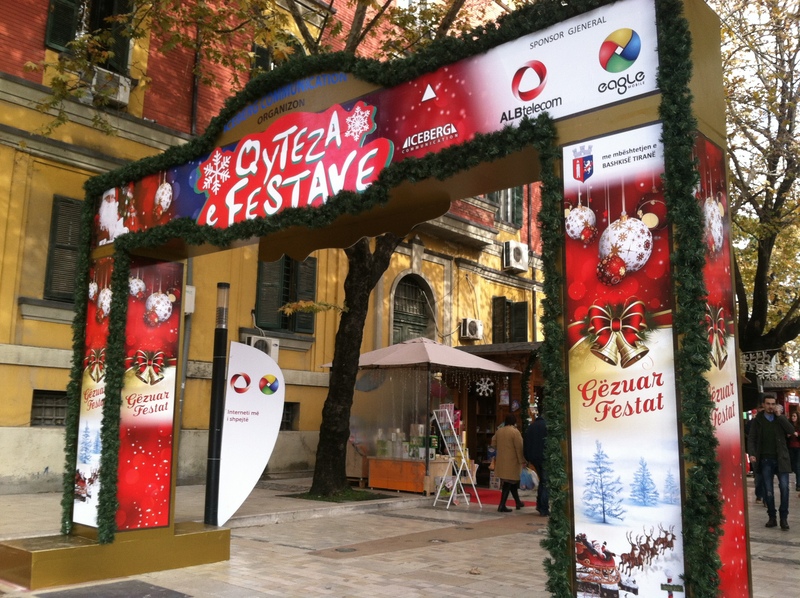 Tirana is very festive for the season and it was awesome to see all the holiday decorations – definitely put my in the holiday spirit! 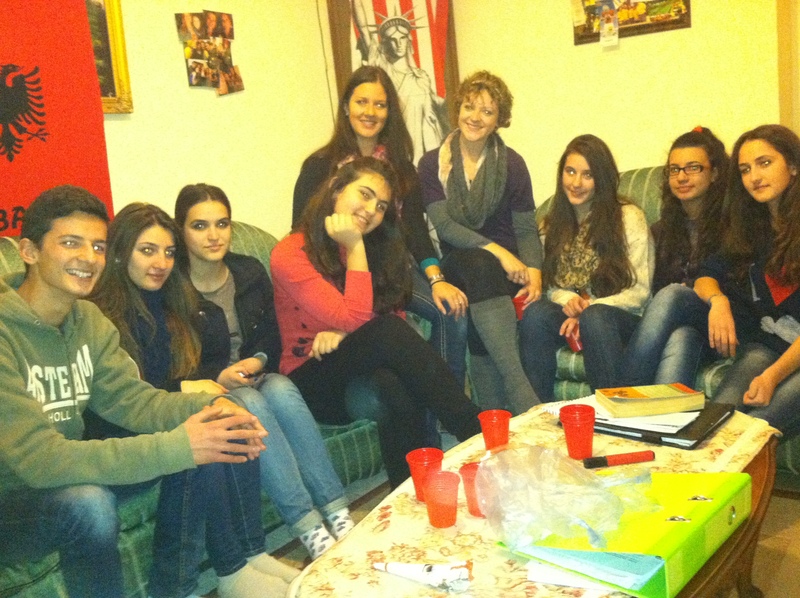 And after exploring Tirana, I went back to site to hang out with my site-mate Kate and some of her Model UN students for a little celebration at her house. 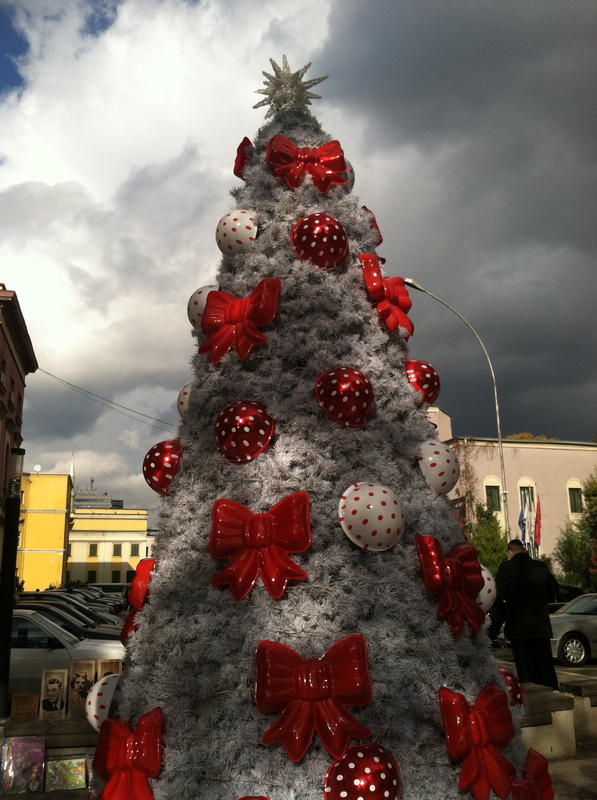 Culture note: In Albania, Christmas trees are often thought of as New Years trees. Many Muslim families will buy trees for their home to celebrate the New Year. 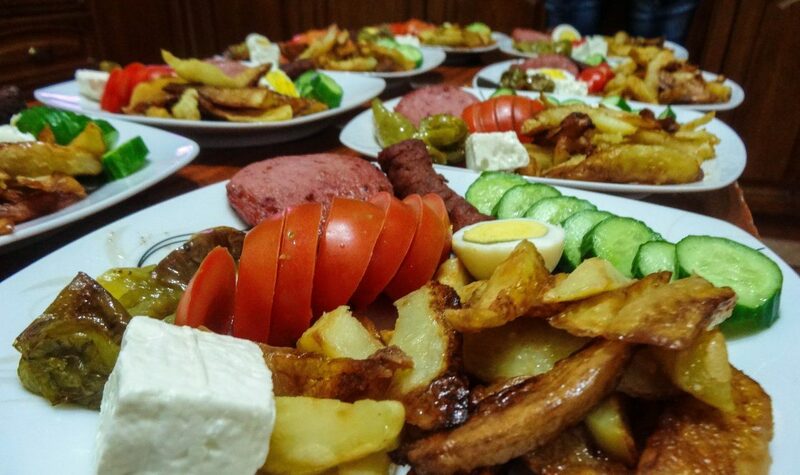 On New Years many Albanians celebrate by having a big dinner at home with family and then after the younger generations will go out clubbing until all hours of the evening. While explaining the tradition of the NYE kiss to one of my Albanian friends I asked her if there were any specific traditions that Albanians partake in during the New Year and she mentioned that sometimes females will buy all new underwear to celebrate the New Year. 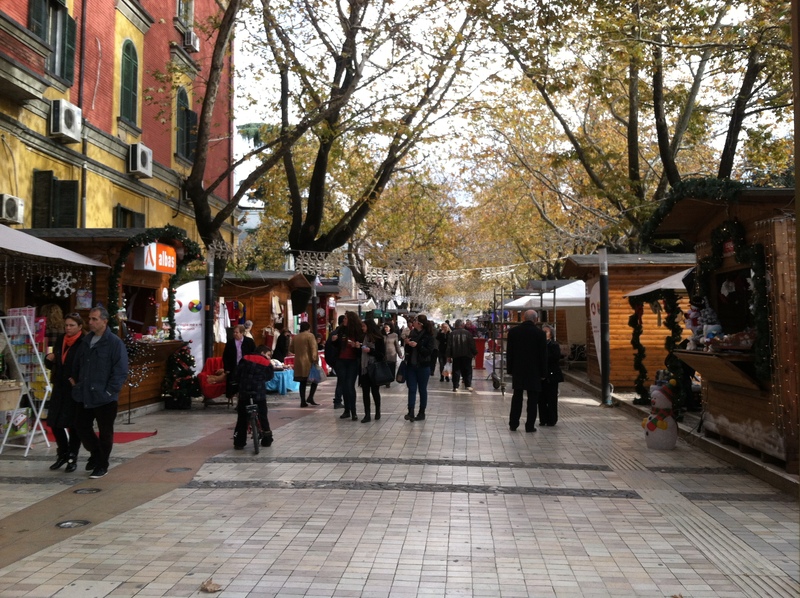 There was a nice road to buy gifts near the center of the city. The big holiday tree in the center. 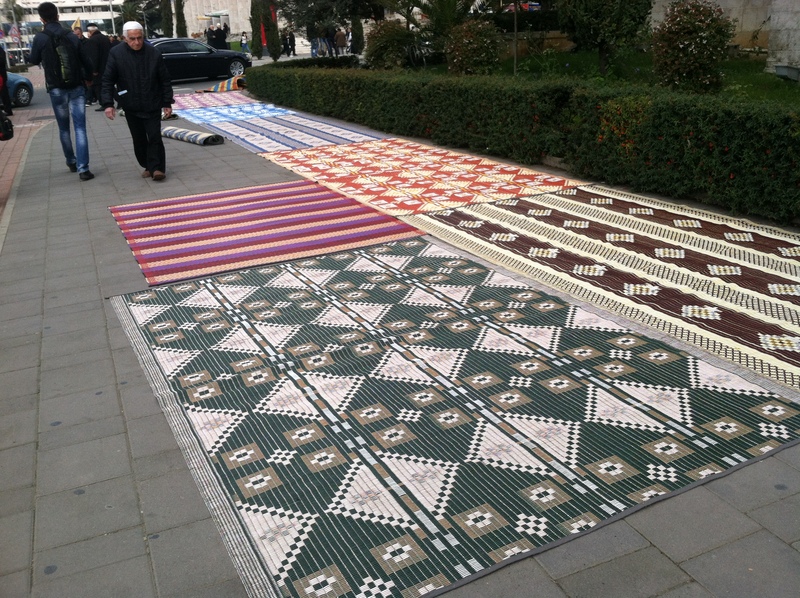 Ran into some men putting down rugs so that people could pray during the call to prayer. 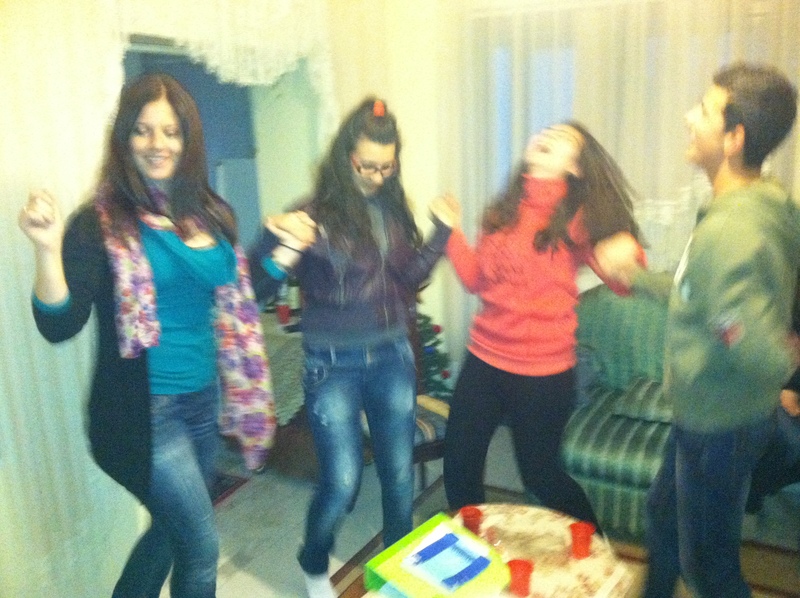 There was even the infamous Albanian circle dance aka valle. 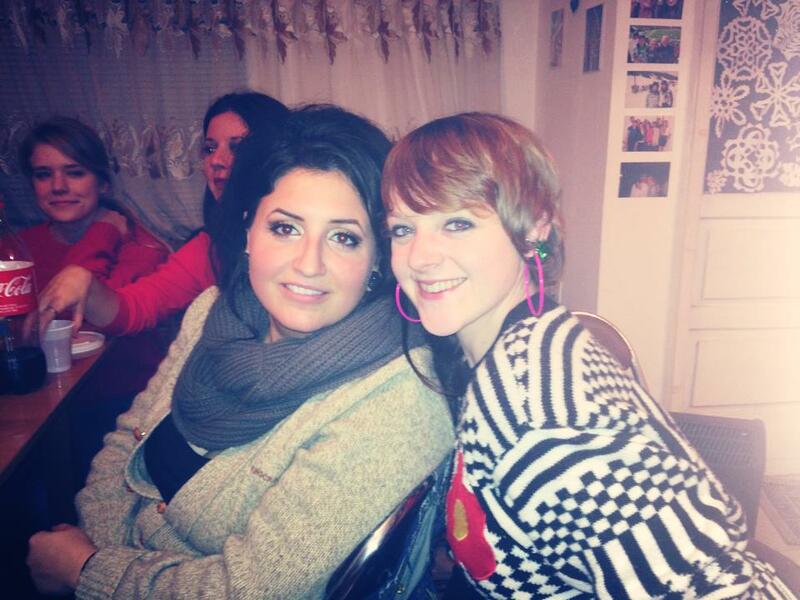 Coffee with Entela in Durres. 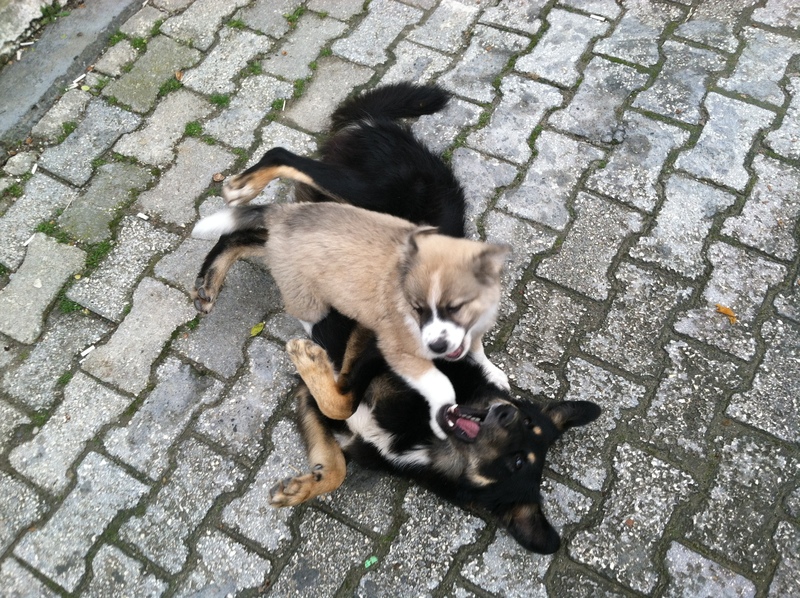 And sometimes I am lucky and run into these two cuties outside my apartment. Back in America, Thanksgiving was always a big family holiday. The family event was always held at my father’s house and every year I would help him get all the final details together. I would spend the day helping my father make the traditional broccoli salad, making name tags for the family, and anything else that needed some last minute help. A few days before Thanksgiving, my father and I would always set up our Christmas tree and decorations, so that the rest of his family could gawk at the decorations over the traditional family feast. For the first time in my 23 years of existence, I not only didn’t spend Thanksgiving with my family, but I didn’t even spend the holiday in the same time-zone, on the same continent! 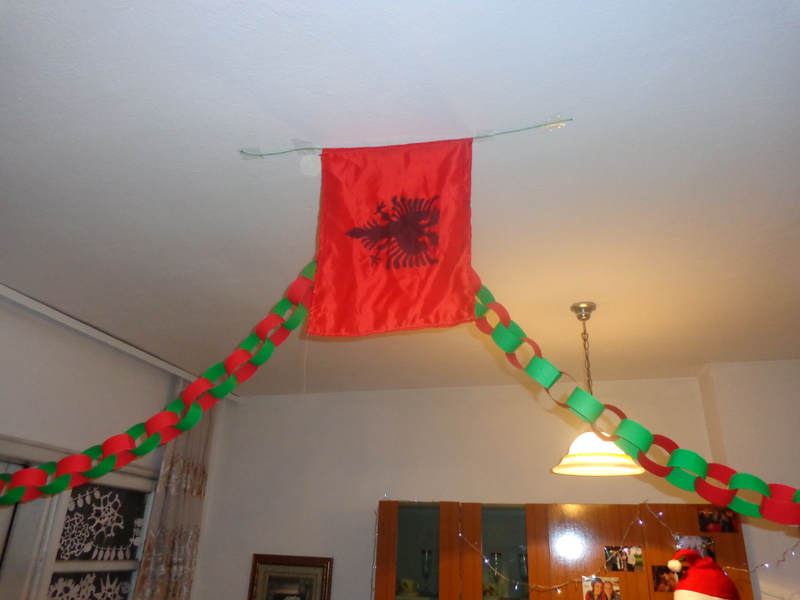 We are eight hours ahead of Colorado here in Albania, so I began the festivities a bit before those back home. Even though I was unable to spend the meal with my blood-family, I realized the importance of friendship and creating my own family – wherever life may lead me. The other volunteers have become my support system, my new family, and spending the holiday with so many like-minded people was a real treat. I was also lucky enough to celebrate thanksgiving not once, but twice!! 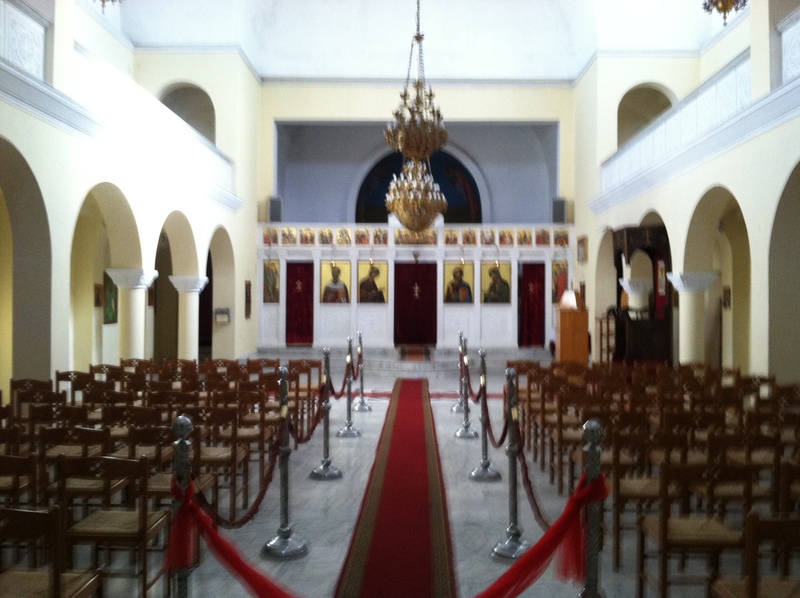 The first Thanksgiving celebration was held in Gjirokaster and the second festivities were held in Corovode. I had never traveled to either city before, so it was really exciting for me to explore new cities in this beautiful country! I missed my family, but I honestly had one of the best Thanksgivings of my life celebrating with my new family of friends. My first Thanksgiving adventure started the morning of. My friend Brendan came to my site the night before so that we could make the long travel down south together. 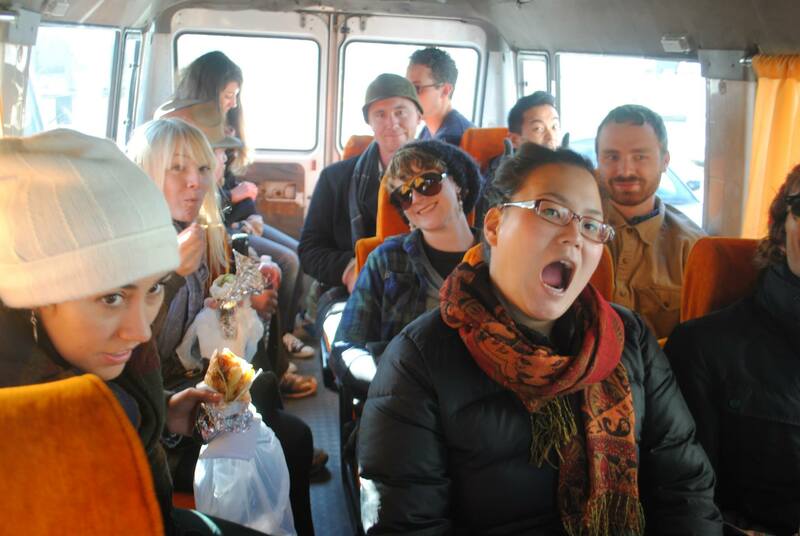 To get to Gjirokaster from my site it takes about five hours by bus, which is a LONG travel time for volunteers, especially alone. So we walked out the highway at 9am and stood along the highway for a few minutes before finally catching a ride down south. 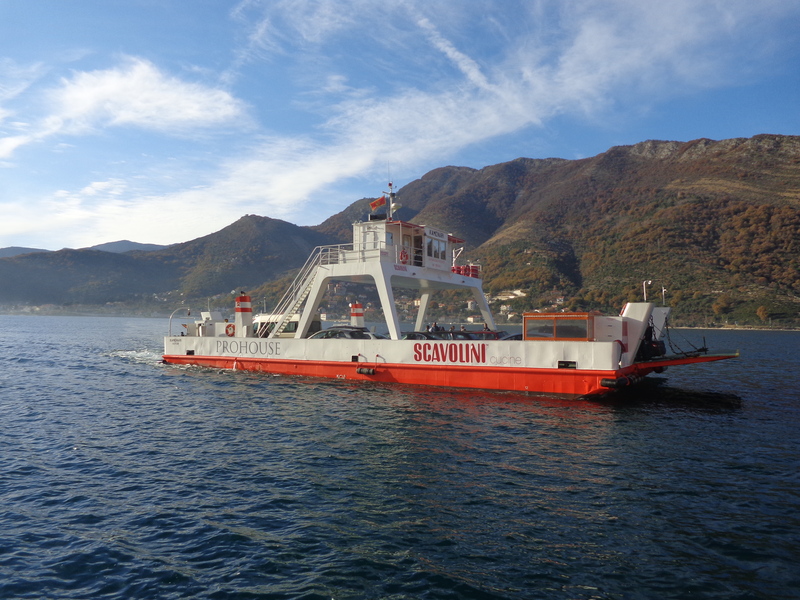 We caught a bus heading towards Saranda, a beautiful beach city in southern Albania. 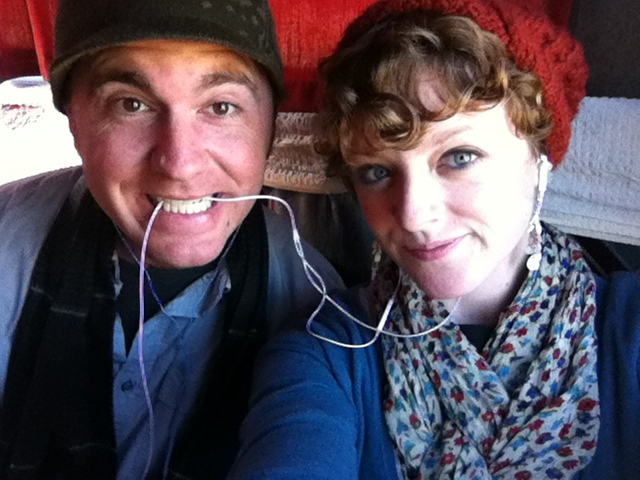 Once we got on the bus, we had the lovely realization that every seat on the bus was full – great. No one wants to stand on a five hour bus ride going south. Luckily, a nice Albanian guy let me have his seat because he was getting off the bus in a nearby city and the bus attendant ushered Brendan up front to sit with the driver – so much for traveling together. 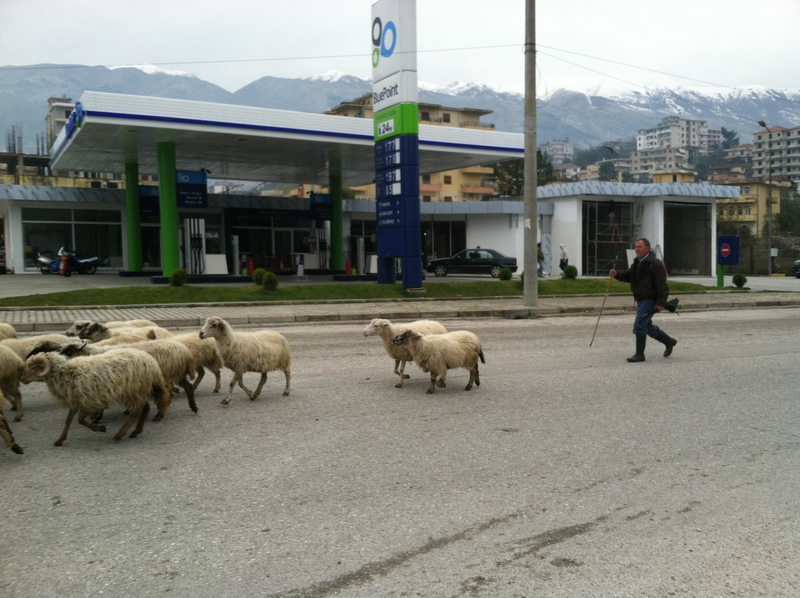 In Albania (and in life), things often don’t work out so it’s important to just roll with the punches. I had a wide array of things to do on the long bus ride and often find it relaxing to just zone out. I caught up on some reading on my kindle (thanks mom and dad) and listened to some music. For the last hour Brendan and I were lucky enough to find a couple seats and sit together. 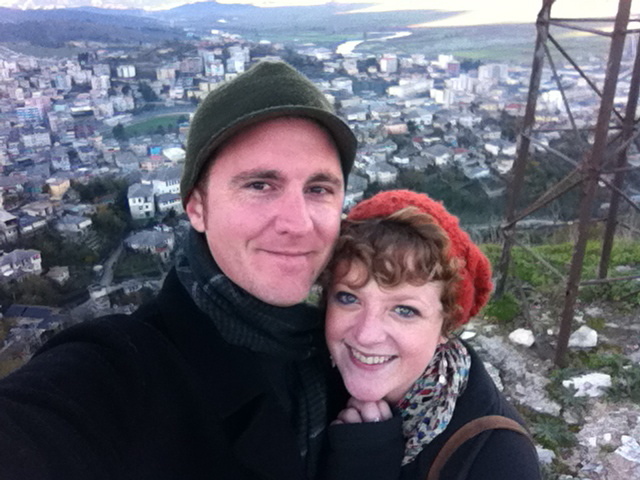 Once we arrived in Gjirokaster we trekked up the hill to Tyler’s apartment – the Community Development volunteer in that city. 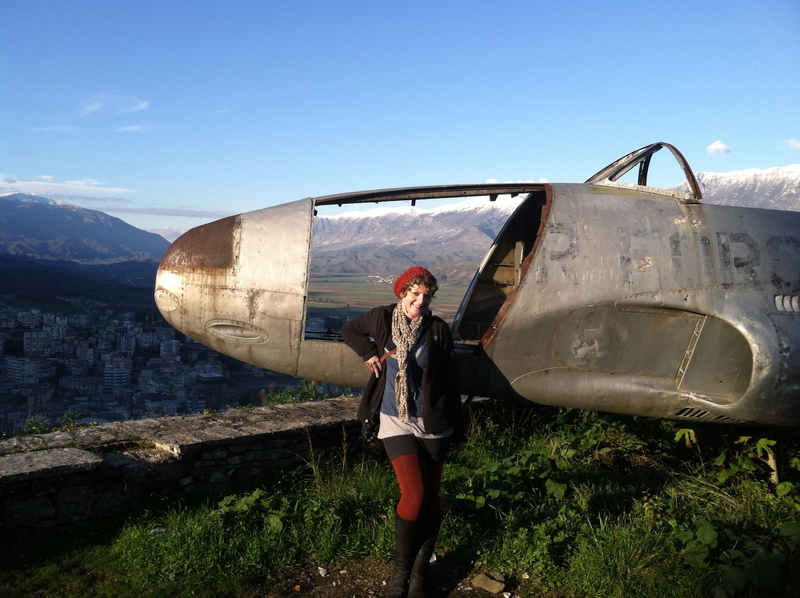 Gjirokaster is split into two parts, old town and new town, and Tyler lives in old town. He definitely has one of the nicer Peace Corps apartments that I have been to. He has a beautiful view of the city and is only a ten minute walk away from the castle. Since I had never visited Gjirokaster before I wanted to see some of the sites before dinner commenced, so I convinced Brendan to visit the castle with me. 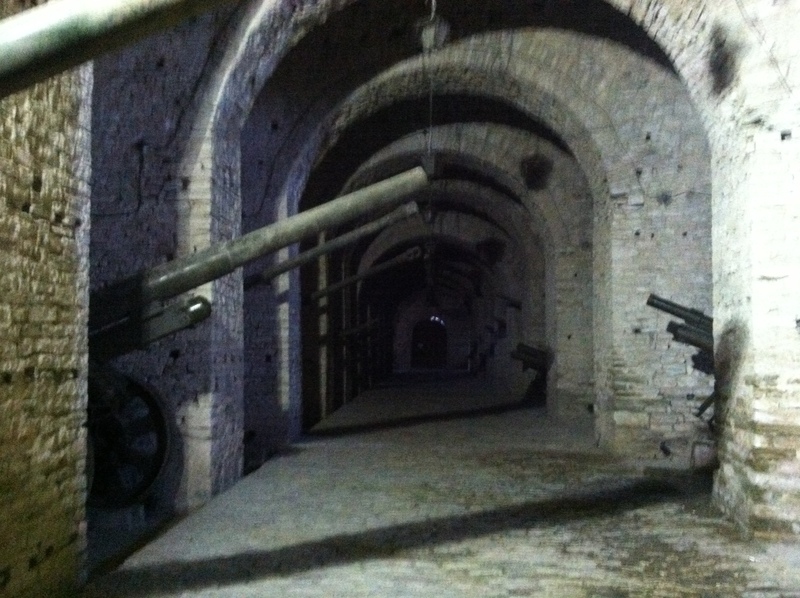 It is definitely the best castle that I have been to in Albania thus far. 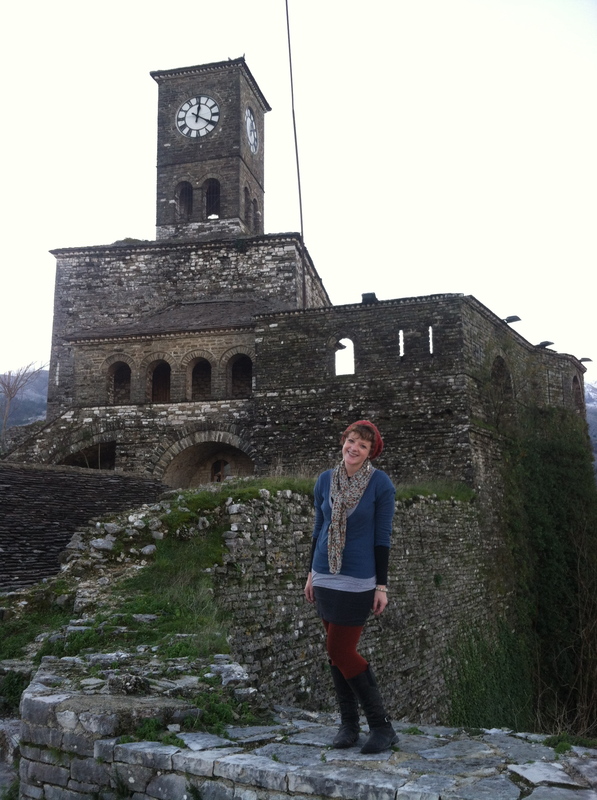 A year ago I never thought that I would be exploring castles on thanksgiving, but life has given me so many gifts along with my service and time here in Albania. We explored the castle, played in the vintage plane, attempted some yoga moves, and had a fun time seeing the sights together. After that, we headed back to Tyler’s place for Thanksgiving dinner. Another one of the volunteers had a great idea for holiday crafts, so we all made fun, little Thanksgiving turkeys with our handprints. It was cute and a nice memory from my childhood. We also each wrote down something that we were thankful for and shared the statements anonymously during dinner – it was fun! As far as the actual dinner goes, it was amazing. About twenty volunteers and some Albanians from around the county came together and each brought their own special contribution to the dinner. SO MUCH FOOD! It was great. I made lemon bars and chocolate chip cookies that went over really well. In Albania, turkeys are CRAZY expensive – about $70. Turkeys are a specialty that Albanians usually cook during Christmas and the New Year. Since they are only eaten on special occasions, my Albanian friends have told me that, Albanians do not mind fronting the extra money. Once dinner was over we had a nice Peace Corps dance party (my favorite thing – I am missing Colorado concerts so bad), but for now dance parties in apartments will have to do. 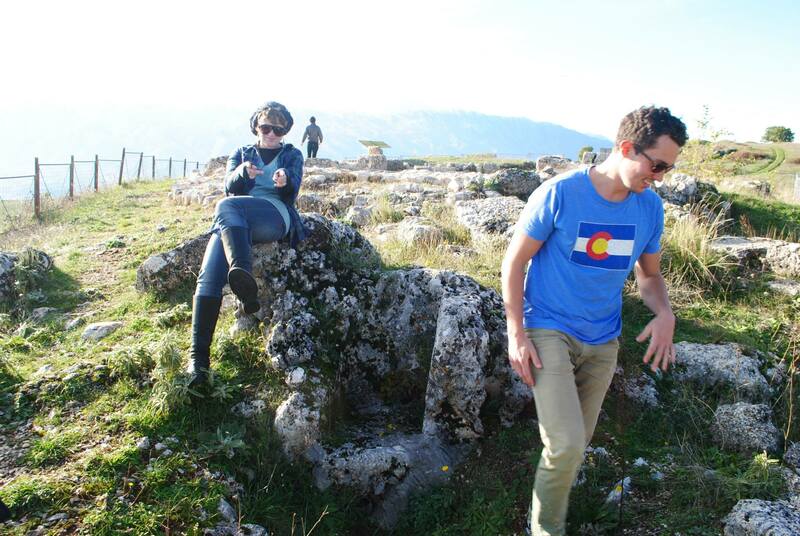 The next day we all went to go see Antigone – the ruins of an Illyrian city. That was really fun too! We explored and took fun photos. 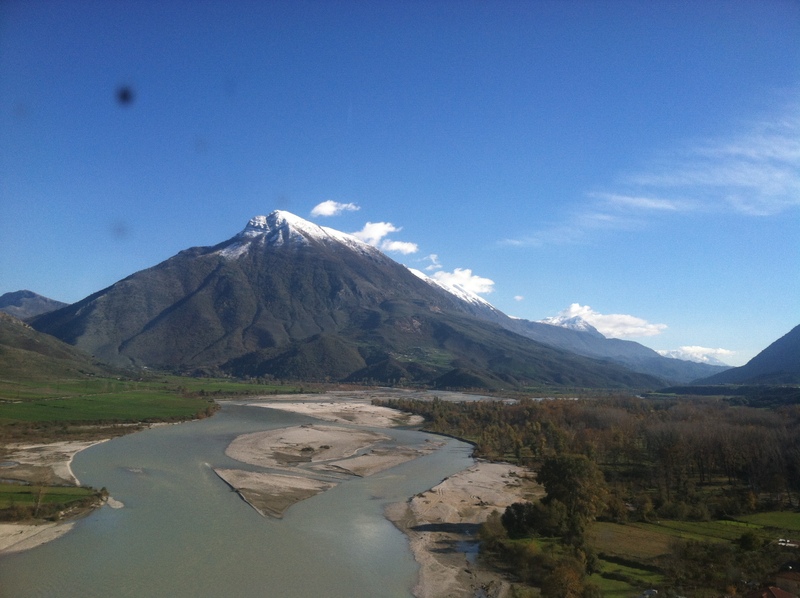 The view from the bus on the way down to Gjirokaster. Finally getting to sit with each other on the bus. An ancient plane at the castle. 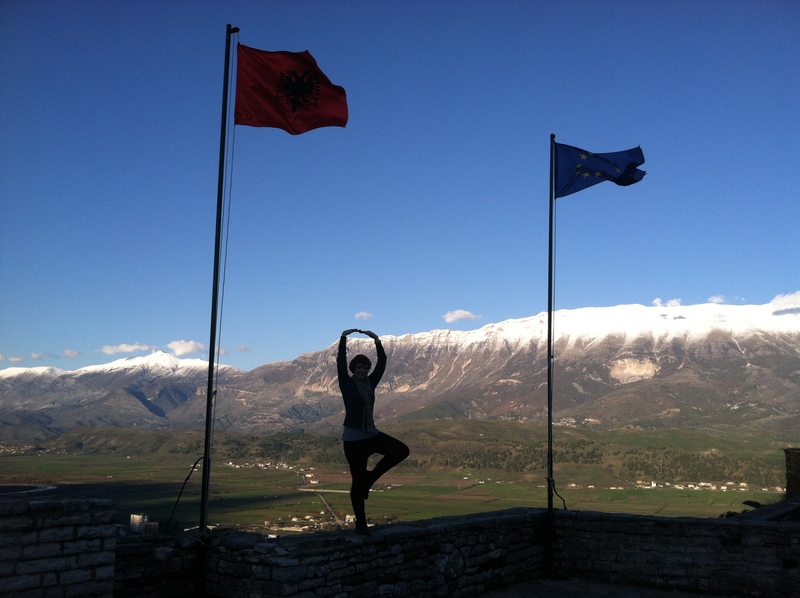 Representing my inner yogini with the Albanian flag waving high. The clock tower, so beautiful. The amphitheater in the castle. 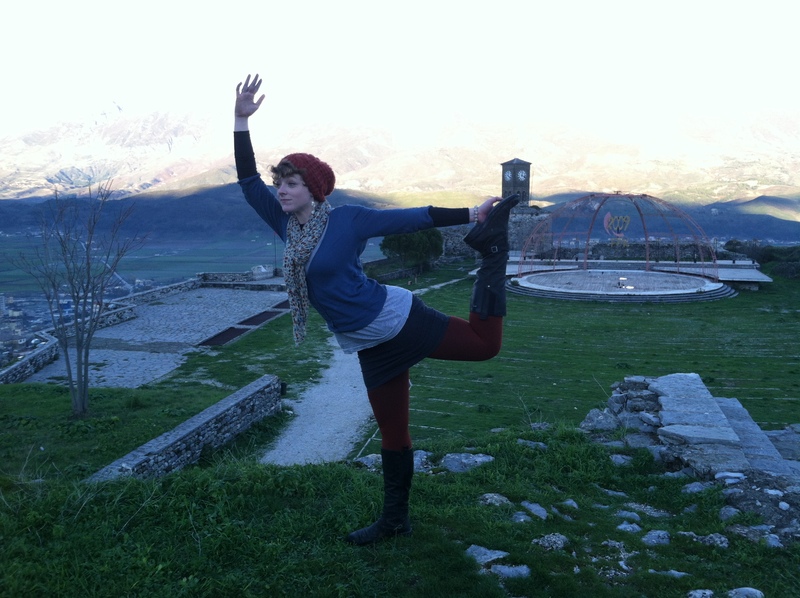 Dancer pose – love spending my thanksgiving doing yoga in an European castle. 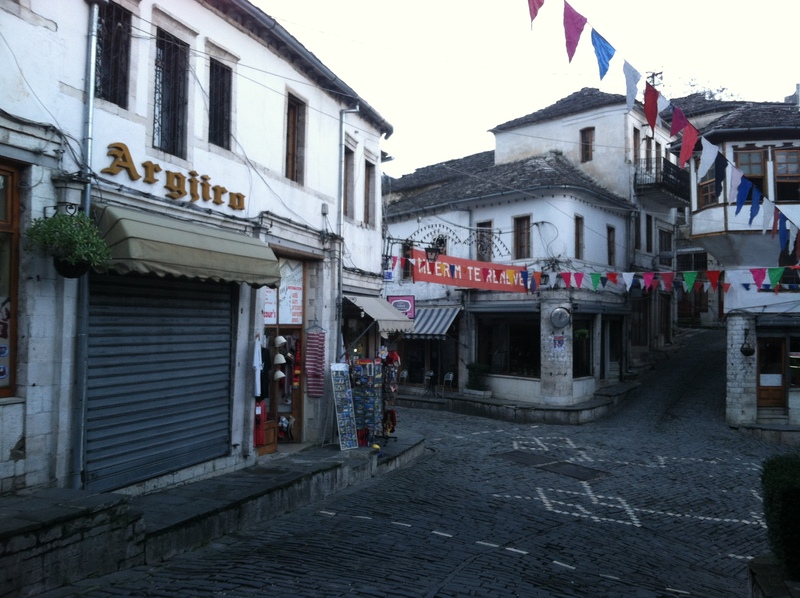 The corner of old town Gjirokaster near Tyler’s apartment. 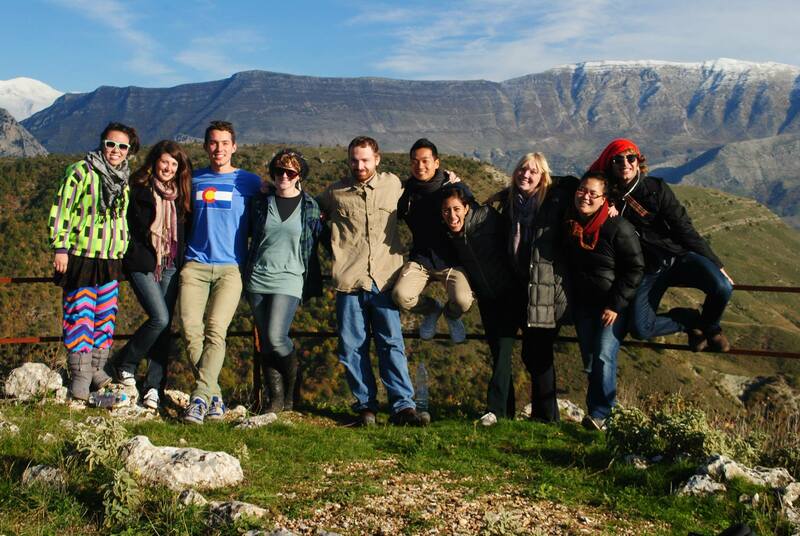 The whole group for Thanksgiving in Gjirokaster. We ran into a herd of sheep on our way traveling out of town. 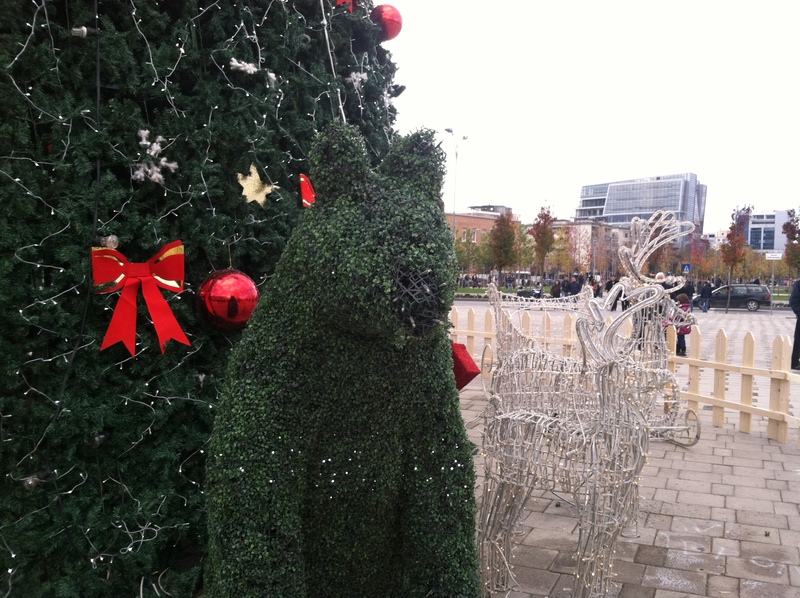 Like I mentioned before SHEEP ARE EVERYWHERE – EVEN IN THE BIG CITIES! 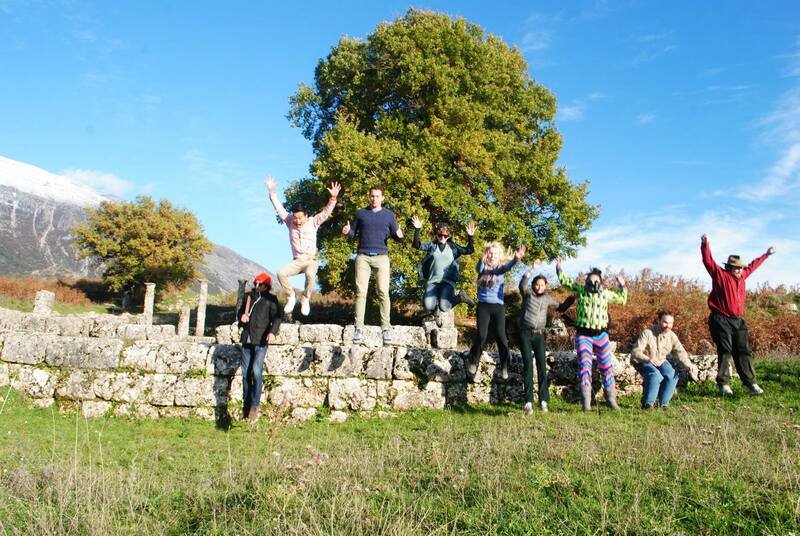 After we finished all the festivites in Gjirokaster, a group of us brave volunteers headed to Thanksgiving round two in Çorovode. Çorovode is actually fairly close in proximity to Gjirokaster, but because of lack of roads we had to travel up to the center of the country and then back down through the one road through Berat that connects Çorovode to the rest of the country. 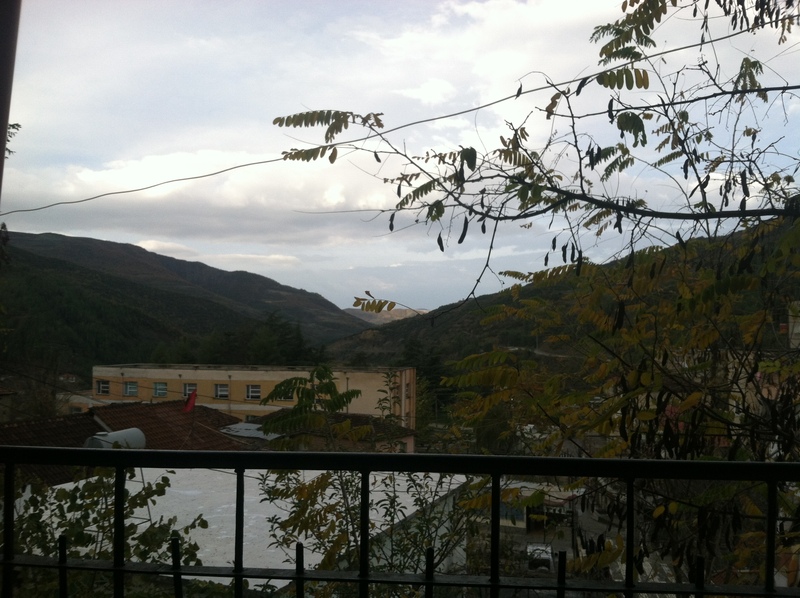 Our trip from Gjirokaster to Çorovode was long and strenuous. We began traveling around 8am and didn’t arrive until dusk (granted it gets dark in the winter here between 3pm and 4pm). It was an extremely long day of traveling, our first bus towards Berat was stopped by a police checkpoint for quite a while. Now that the new government has come into power, police are beginning to crack down more – which is a nice thing. However, being a passenger during these random stops is often less than ideal. The first bus to Berat took about three or four hours. 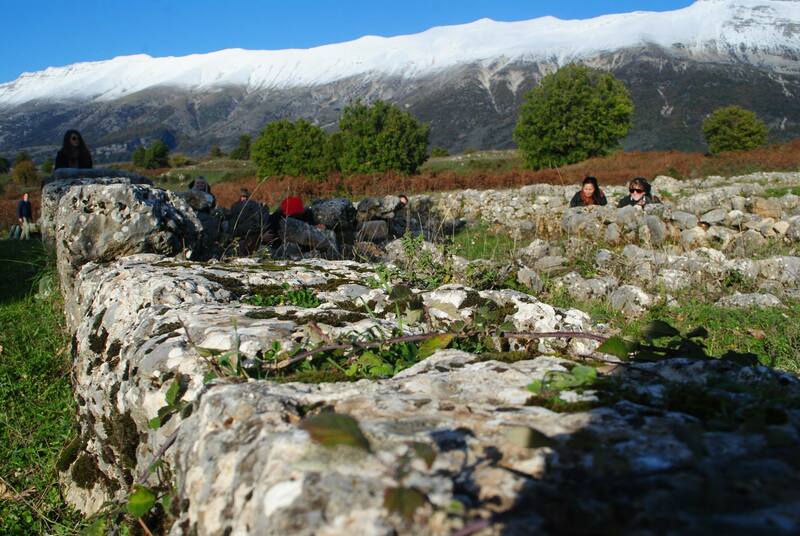 After that we met up with some more volunteers in Berat and all traveled down to Corovode together. Almost all of us managed to get seat, which was nice considering the road can be very windy and bumpy at parts. After arriving in Corovode, we headed to the coffee shop where the party was going to be held. Some of us began playing card games while waiting for the rest of the food to cook. Honestly, the food cooked in Corovode was absolutely amazing, probably some of the best food that I have ever had for the holidays (besides my grandma’s cooking of course)! 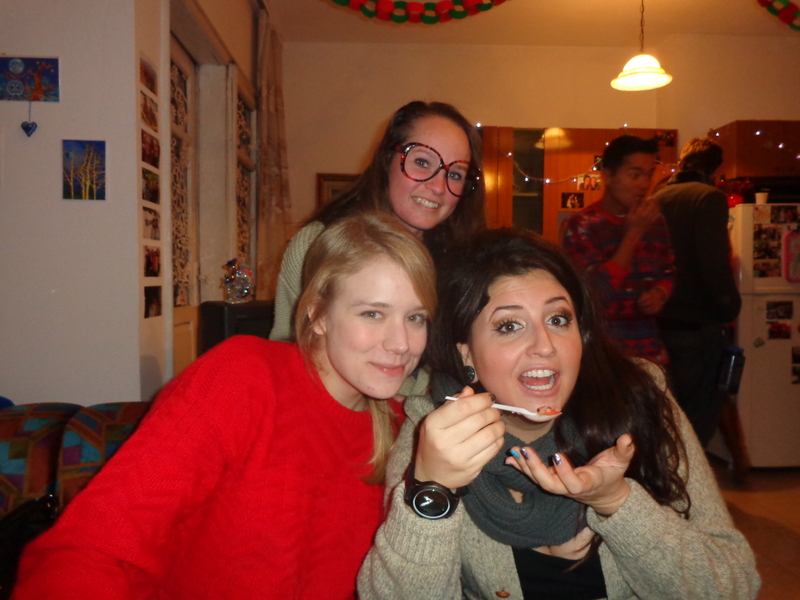 Overall both festivities were lots of fun and my first thanksgiving outside of the United States was a major success!